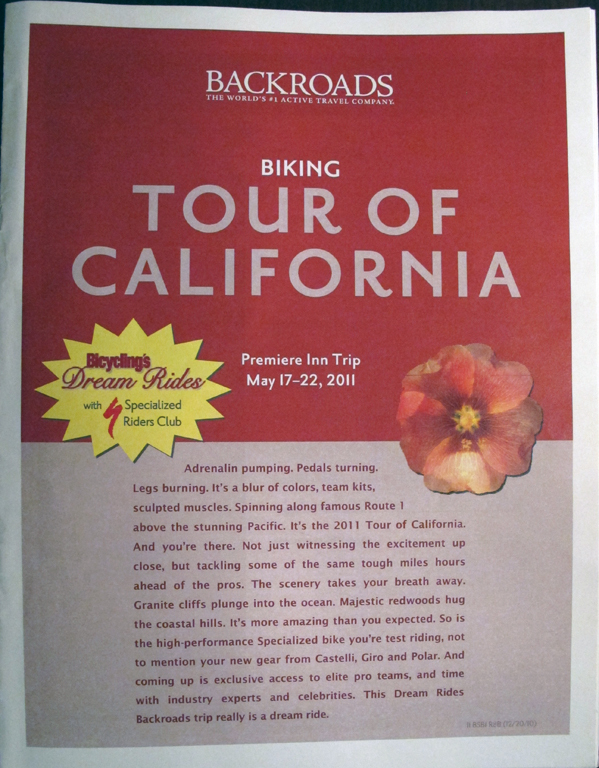 It had been six years since our last Backroads trip and we were really looking forward to another one when Anne saw that they were advertising their "Tour of California" trip, following the professional racers around the state while allowing us to ride parts of the route and cycle down the beautiful California coast. She signed us up immediately! This also happened to coincide with our 29th wedding anniversary on May 15th. 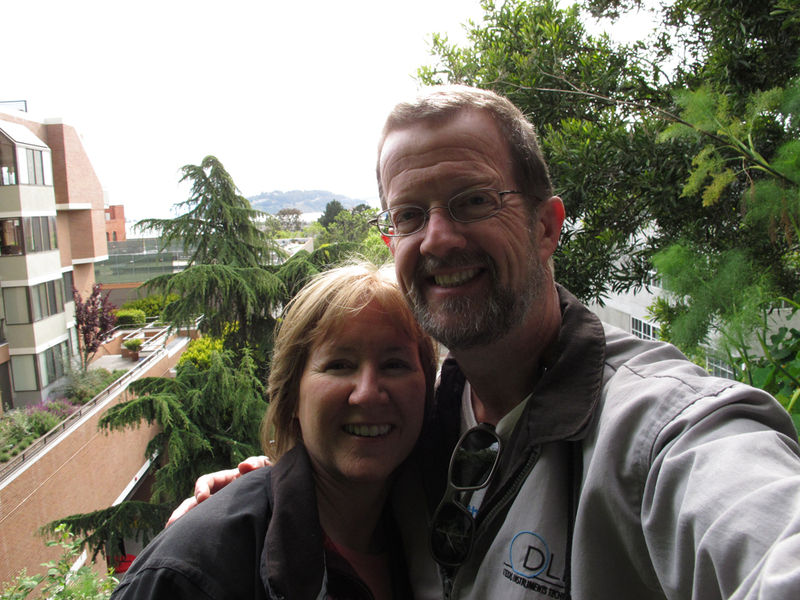 Although the race started Sunday, the Backroads trip started Tuesday, May 17th, but we flew into San Francisco two days early to start our anniversary celebration. 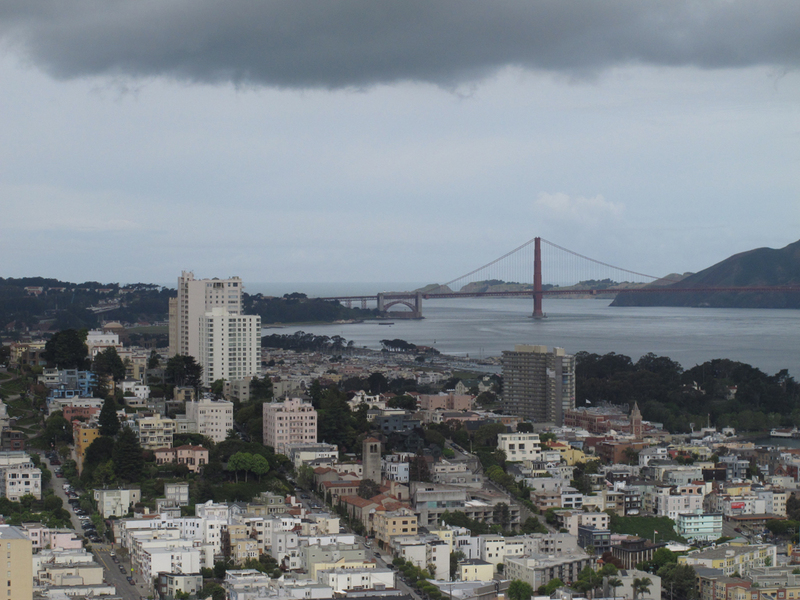 We took a taxi from the airport to the Hotel Vitale near the Bay Bridge, already feeling right back at home in the Bay Area with the smell of eucalyptus hanging in the moisture laden air. The day was uncharacteristically sunny, the sky azure, with huge puffy clouds hanging over the port. The hotel was hopping but our room wasn't ready yet although it was past check-in time. Turns out they were recovering from the "Bay to Breakers" run which had happened that morning literally outside their door. Apparently it's quite a party in running shoes (and often nothing else). 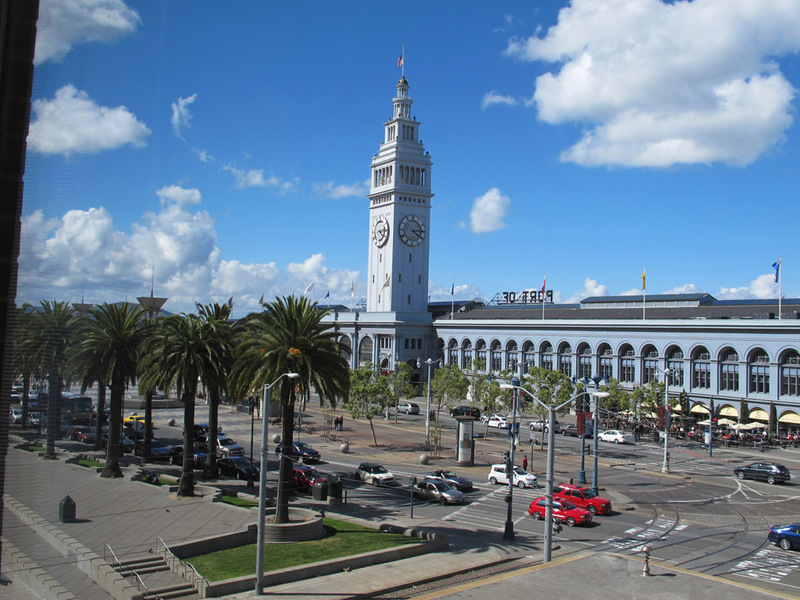 So we opted to walk the area, checking out the Ferry Building while we waited for our room. Turns out the Blue Bottle makes a mean mocha and we were quite content to stroll the pier and trails along the bay, people watching and checking out the quirky city art. 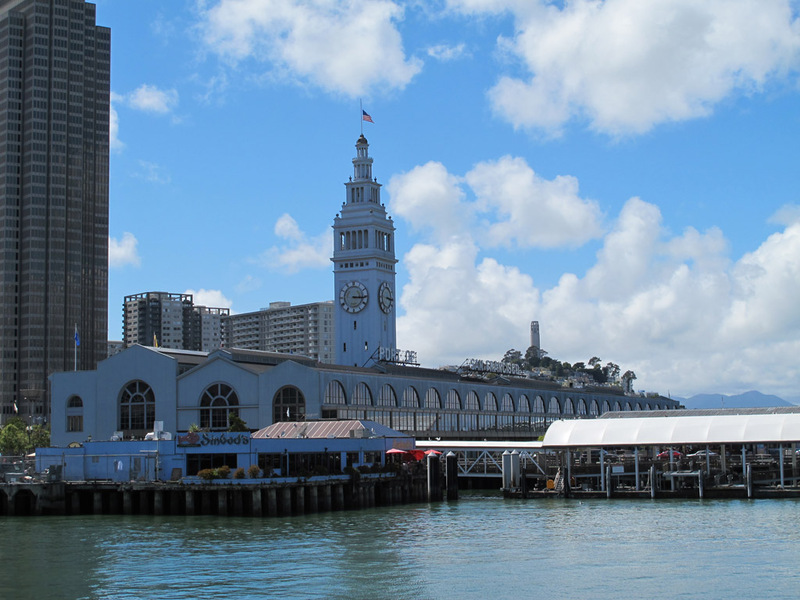 The Ferry Building itself was quite a find with lots of interesting shops of local food and wares, the shoppers in grungy chic sandals and draped wraps and facial hair, piercings and tatoos of all varieties. When we got back to our room, it was ready and we left the busy lobby to find a zen-like experience on the 5th floor, all bamboo and light filtered through stained glass. 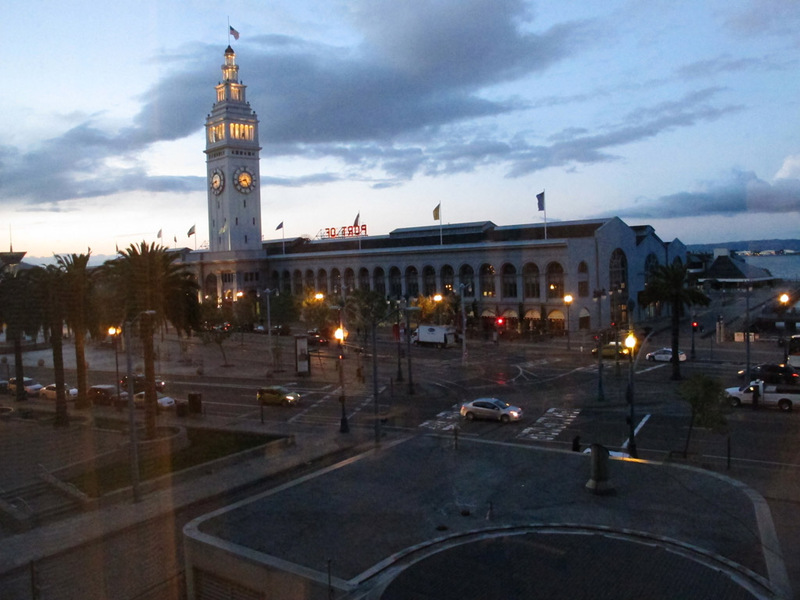 Our room looked out onto the Port of San Francisco, a beautiful view as the sun set over the water. 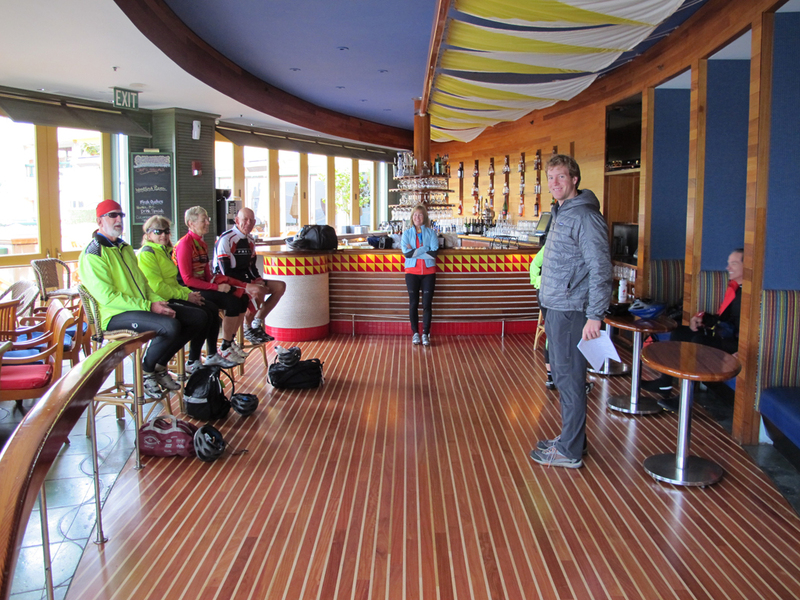 We checked in on the tour and found that, sadly, Day 1 for the racers had been cancelled! Apparently they were getting 5 inches of snow in Lake Tahoe, the stage's start and finish locale. Back downstairs, the hotel treated us to free wine due to the late check-in so we took it outside on their patio. A brisk breeze picked up in the 55 degree air temps, so a server came out and lighted one of Stewart's favorite "fancy heaters" just for us. We went walking in search of dinner and found a nice outside table at the Market Bar where our server was dressed in a tutu in honor of B2B. Stewart's seafood pot pie had a wonderful carmelized crispy crust and Anne enjoyed her two favorite foods in one asparagus / salmon pasta. Although we had layered up, the winds whipped up as the sun went down and we returned to the room chilled but happy. A bubble bath did the trick for Anne and we settled into a great night's sleep two hours late in the new time zone. Anne found a "Local Food in San Francisco" book in the bedstand and we looked up restaurants, finding an excellent reference for Boulette's Larder in the Ferry Building, and it was amazing. 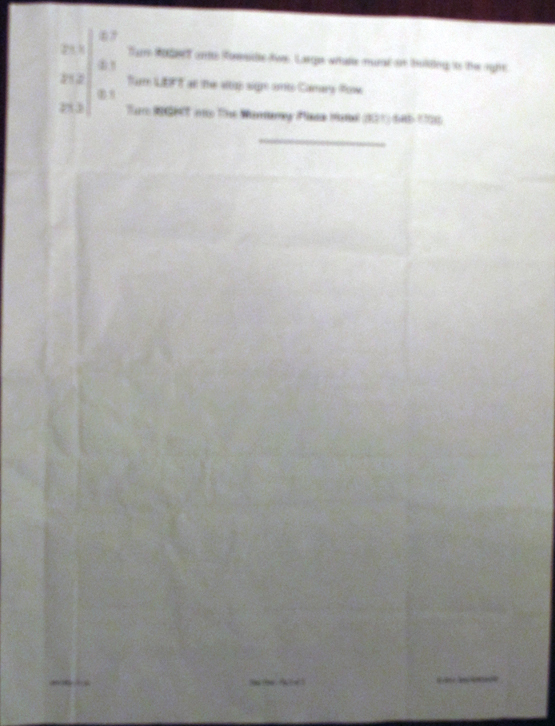 They have a new menu every day and were just printing it up as we arrived. We sat at one of their tables that line the hallway watching patrons across the hall filling up on granola and fruit while we enjoyed porridge with flaxseed, farm fresh poached eggs, sourdough breads and French pressed coffee. 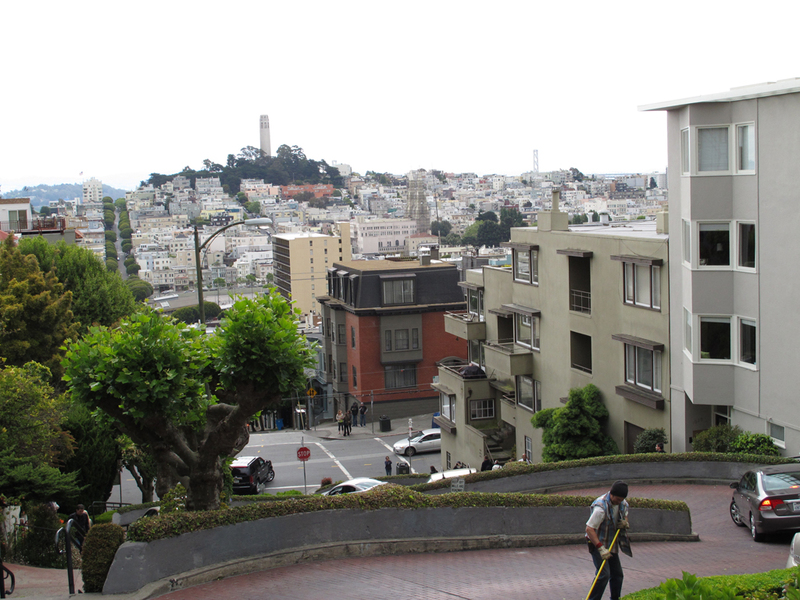 Warm and energized, we headed out to hike the area, starting at Levi's Plaza up the Filbert Steps winding through dense gardens sprinkled with artwork and million dollar condos. 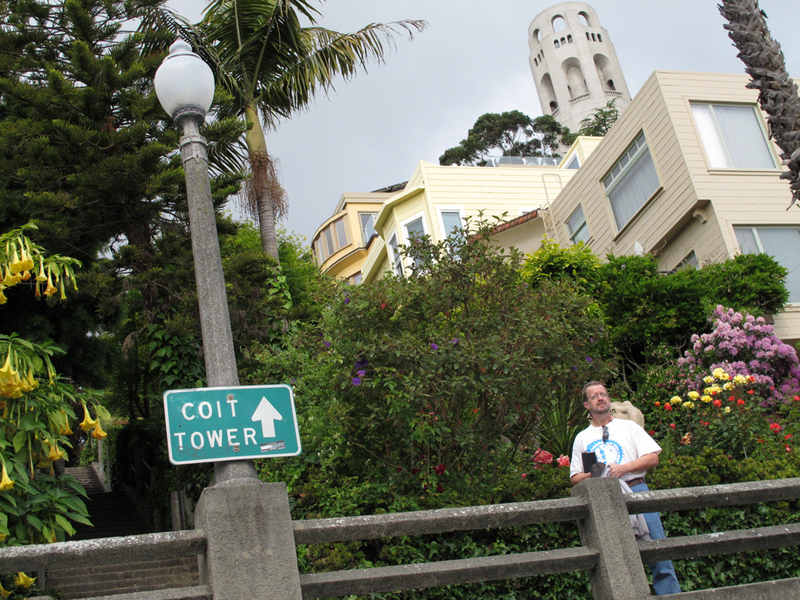 On we went, up, up, up to Coit tower, taking the elevator to the top with stunning views of the bay, roof top terraces and the hills beyond. 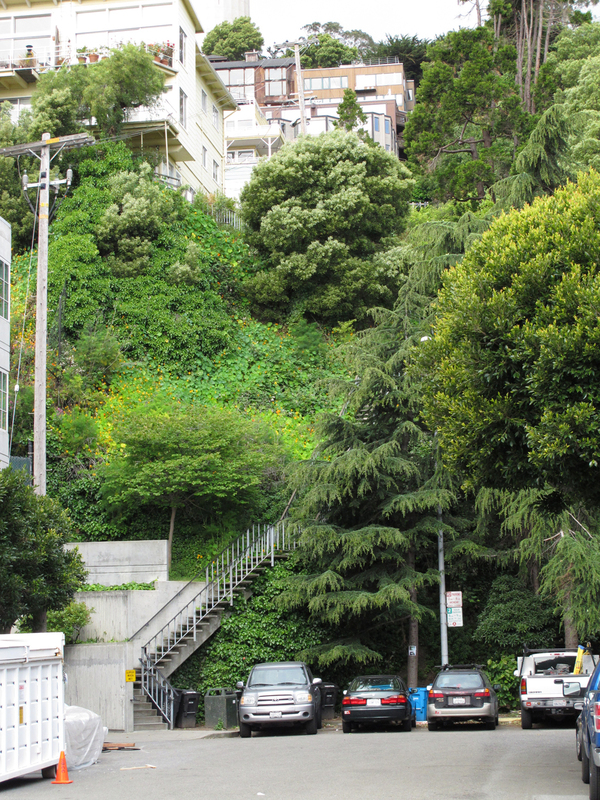 Back down to earth we heard the children laughing and playing at Garfield Elementary while we continued our walk, past Sts Peter and Paul Church wrapped in scaffolding, getting a kick out of the Segway Tour riders, and on to Lombard Street. Up and up again, winding to the top among the growing crowd of tourists, taking our share of pictures on the way. 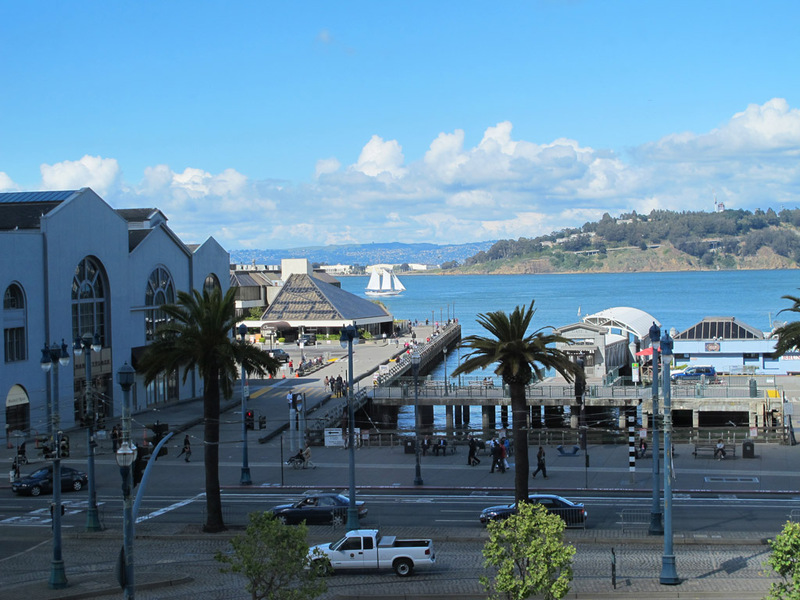 Then we headed east to Pier 41 with its views of kites, sea lions and a few more tourists. We lunched at the Plant Cafe Organic which had enclosed its outdoor seating with clear plastic roll shades and turned on some nice warm (some might say too warm) heaters. We shed the layers to eat, then piled them on again as we made our way out, happy to find that we were close to the Ferry Building just as the rains started. Back in the hotel we grabbed a short nap then checked on the Tour. This time the race was on, but shortened due to snow since they had to move the start down closer to the base of the moutains. Ben Swift won the sprint after a short rain on the 3 lap circuit. We watched it live on the iPad using the Shack Tour Tracker, a really nice app that allowed us to catch the video with Phil Liggett and Paul Sherwin narrating. But then it rained, rained, rained. Stewart had left his watch at home so we went searching for a new one and had one umbrella. The hotel loaned us a second one and we tromped the streets to the indoor Westfield San Franscisco Center at Market and 5th St. No luck at Champ's or Bloomingdales so we went on down the street to Macy's ... no one carries a Timex with a nylon wrist strap any more. Anne told Stewart to lower his standards. But it was fun weaving through the rush hour commuters either dodging each other's umbrellas or just letting their fancy suits get wet. Finally we gave up, ducked into a Pete's and had coffee on their patio under an overhang for more great people watching. Not in the mood for another big dinner knowing what Backroads would have in store, we at Chipotles, picked up a bottle of Merlot at Drumm Liquor on the way back to the hotel, got back to our room and just _relaxed_! After breakfast chatting with a British business man at the Hotel Vitale restaurant, we started spying folks in bike gear in the lobby. Backroads had asked that we dress ready to bike and bring rain gear so we were ready to ride. 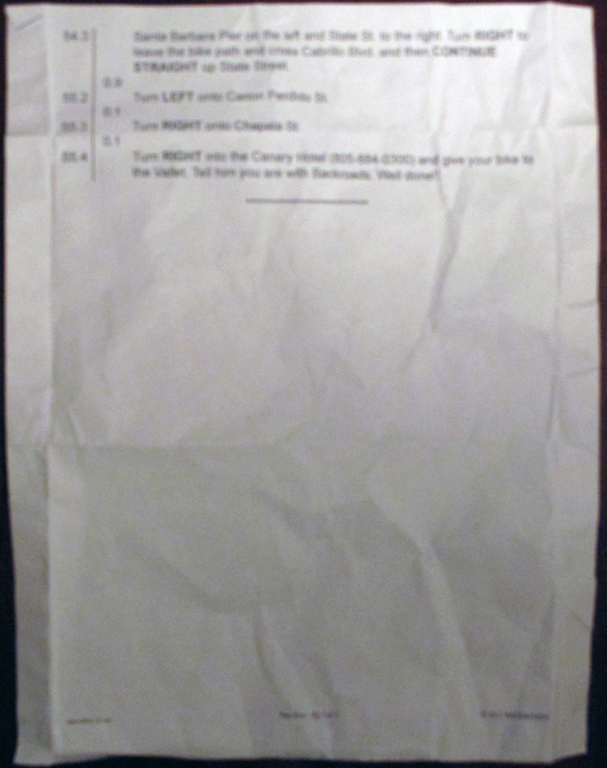 We met Rich and Teri first, then Anne and Tom, Pam and Jeff, and Laurie and John. 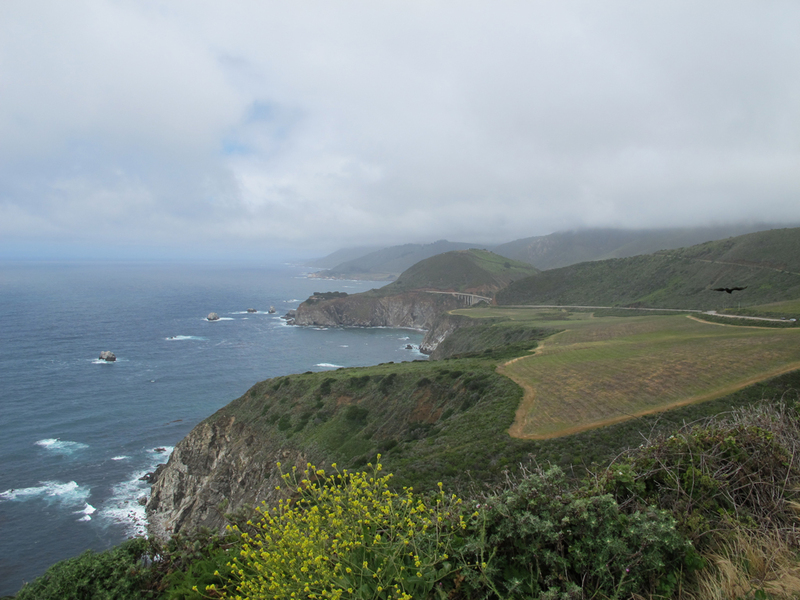 The skies were heavy and the Backroads leaders were late, a highly unusual occurrence. 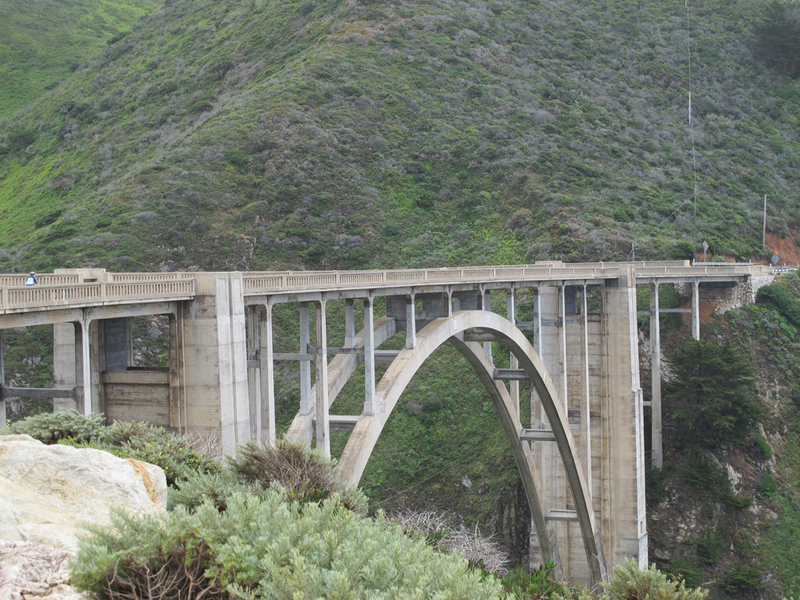 They arrived with news that the Golden Gate Bridge was closed due to a crash. But Rebecca and Dan were charming and relaxed and we immediately felt back in the Backroads vacation zone. 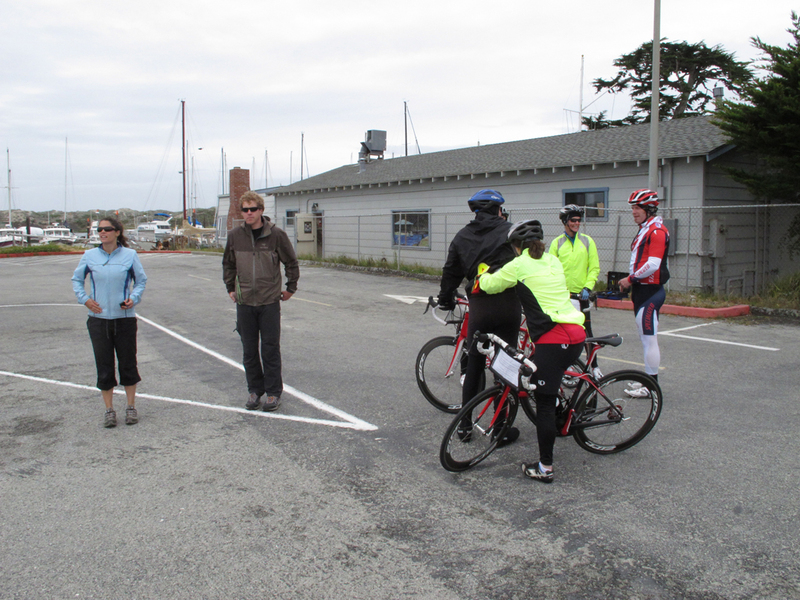 We shuttled to Moss Landing and had a rude greeting for our 1st day biking: 50 degrees, 30 mph winds, biting rain and blustery! It was so cold we put on every piece of clothing BR had recommended: long fingered gloves, arm warmers, leg warmers, heavy jackets, smart wool socks, fleece hat / ear warmers, rain coats and rain pants! 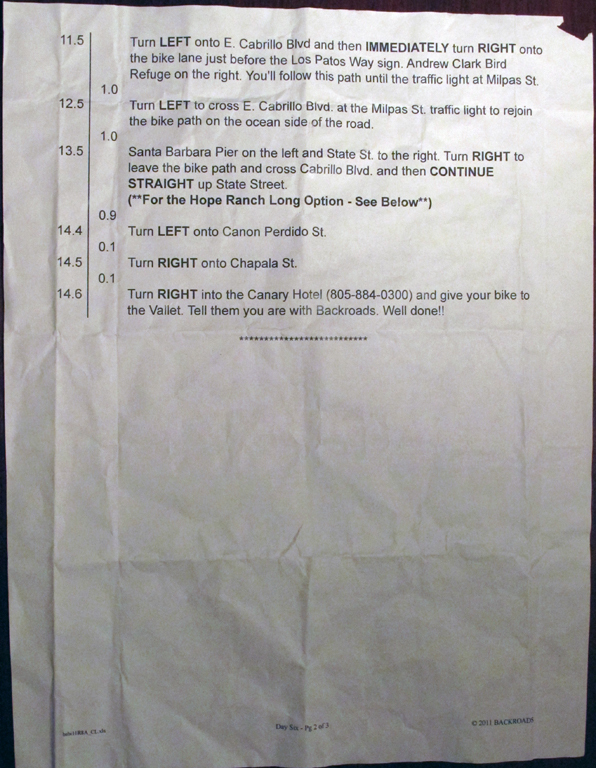 It was the first time for either leader that they actually gave the route rap IN THE VAN! 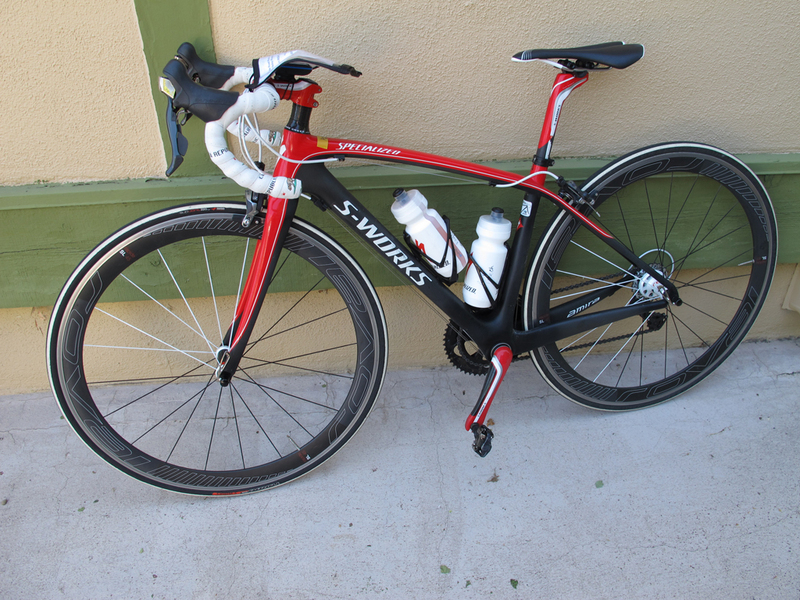 But a Specialized rep, Ian, introduced us to our rides for the week: $7000 racing bikes! 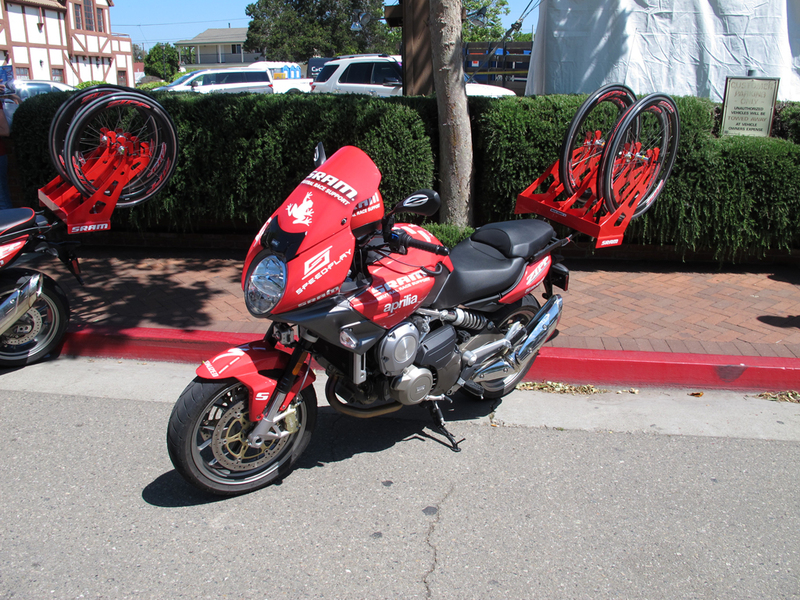 They were demo bikes that Specialized takes on road shows. Stewart got a Tarmac and Anne got an Amira. They were light as a feather, had very skinny tires, and stiff seats. 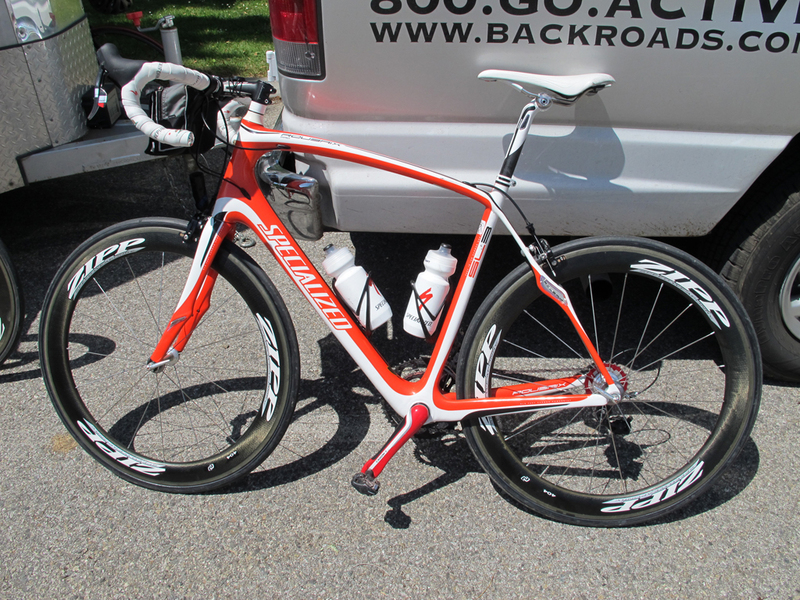 As Stewart later said, "They gave me a bike with racing geometry but I have a touring anatomy!" Other than the seat and the lack of granny gears, the bikes were wonderful to ride. We hit the road in our layers, put our heads down and barrelled on. 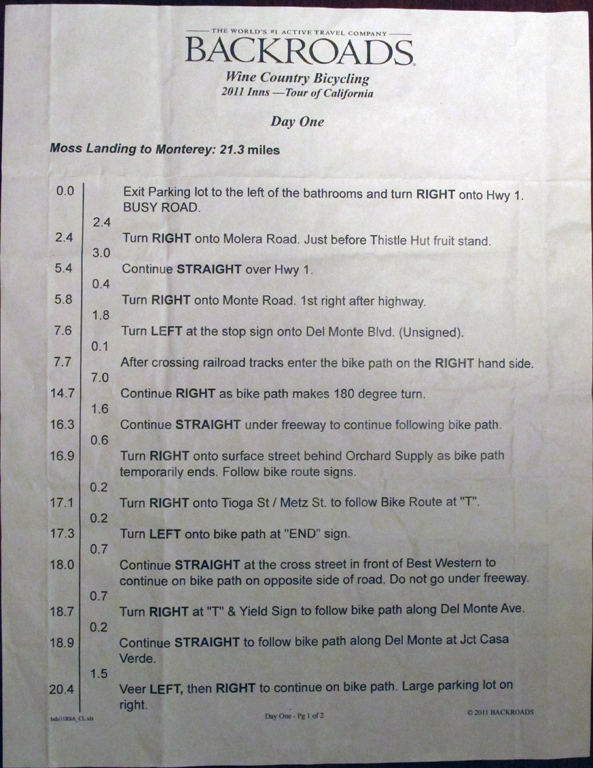 It was only a 22 mile ride into Monterey and much of it was on a bike trail so it ended up fine (once it was over!). 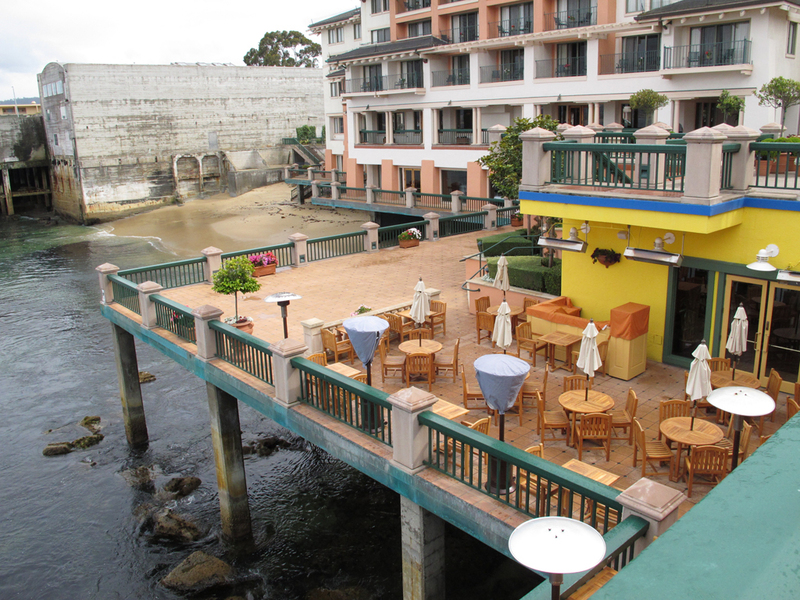 We love the Monterey Plaza Hotel where we had stayed twice before when we went to the Monterey Jazz Festival. We checked into our huge room and the clothes went everywhere!! The Hotel is on Cannery Row so after cleaning up we took a walk. 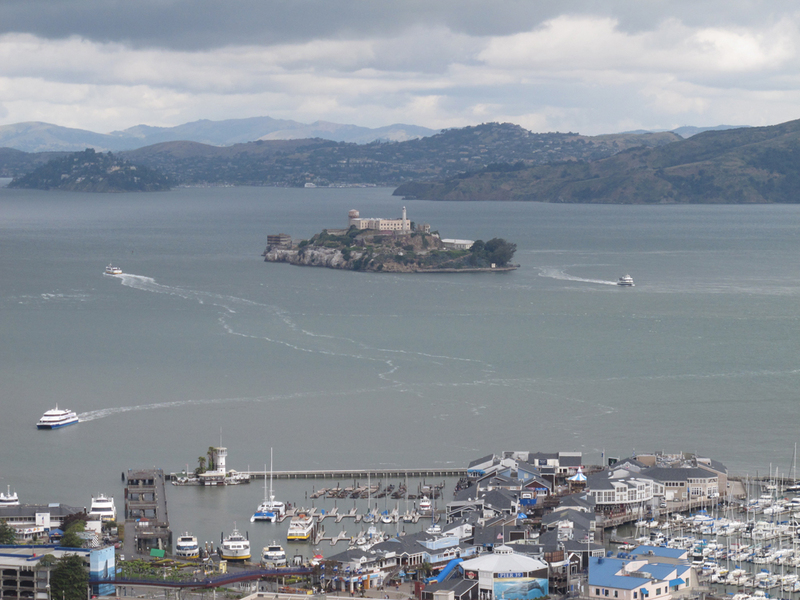 The rain had died down and some sun poked out as we walked the bike trail past the Montery Bay Aquarium, tee shirt and souvenire shops, and found some tasty fudge. It started to rain again as we got back to the hotel so we stopped in the coffee shop next door and got Pete's again ... not missing the Starbucks on this trip! We met for the Backroads Day 1 cocktail tradition with intros all around and heads-up on the week's plans by Dan and Rebecca. The group is pretty laid back and older than I expected. 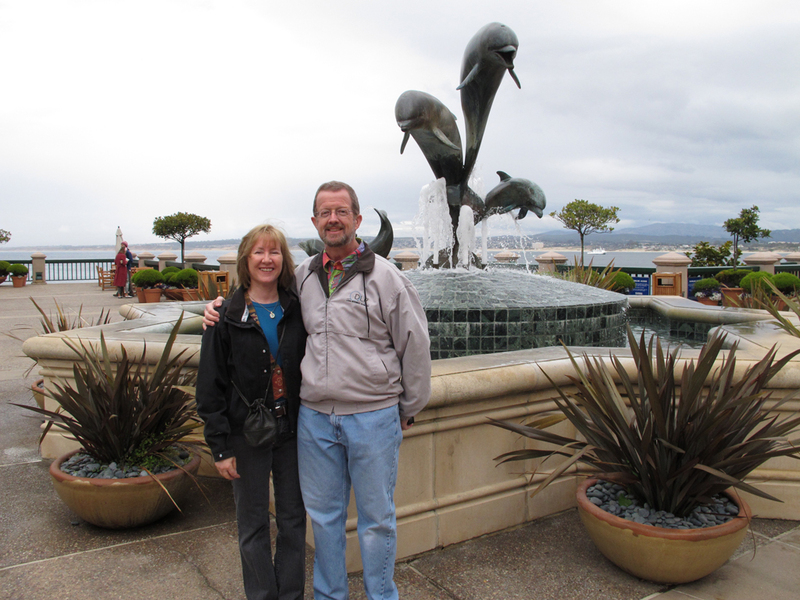 We were one of three couples in our mid-fifties and both other couples were near 70. Awesome what cycling does for you, but sad that the economy probably played a part in the lack of younger riders. Normally there are 26 riders in a BR tour, but only 10 this time. That really helps the flexibity though, especially centered around a race that is already being re-routed. 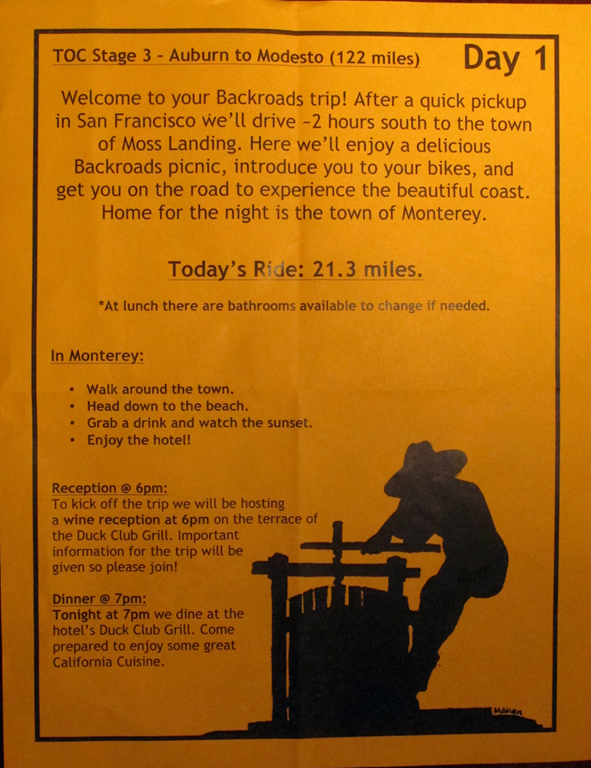 Dinner was at the Duck Club Grill there at the hotel. It juts out over Monterey Bay so we could watch the birds diving into the water as it reflected silvers and golds in the setting sun. 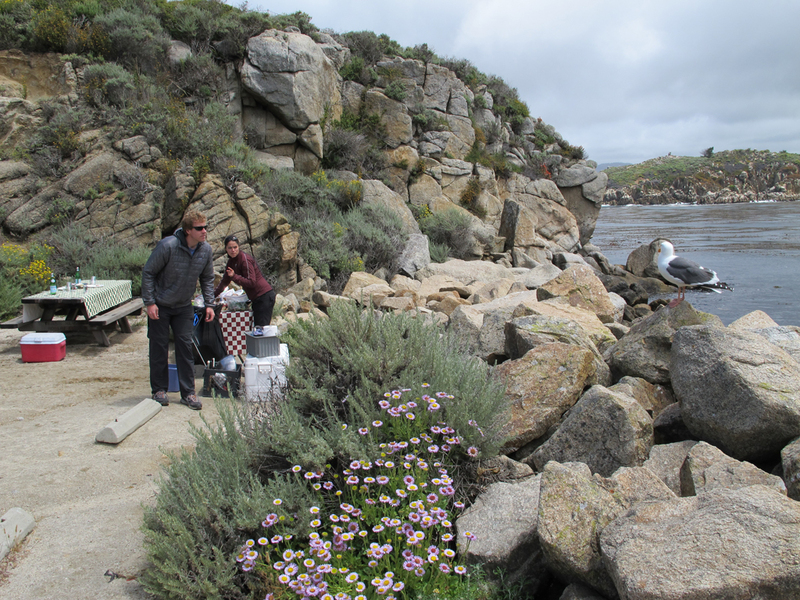 Anne had the artichoke bisque (another local food) and duck, while Stewart had the lamb chops... delicious! Then off to check the stage results (Greg Henderson in a 122 mile ride into Modesto) and hit the sack ready for an awesome week of riding. This day exemplified the best of Backroads cycling. 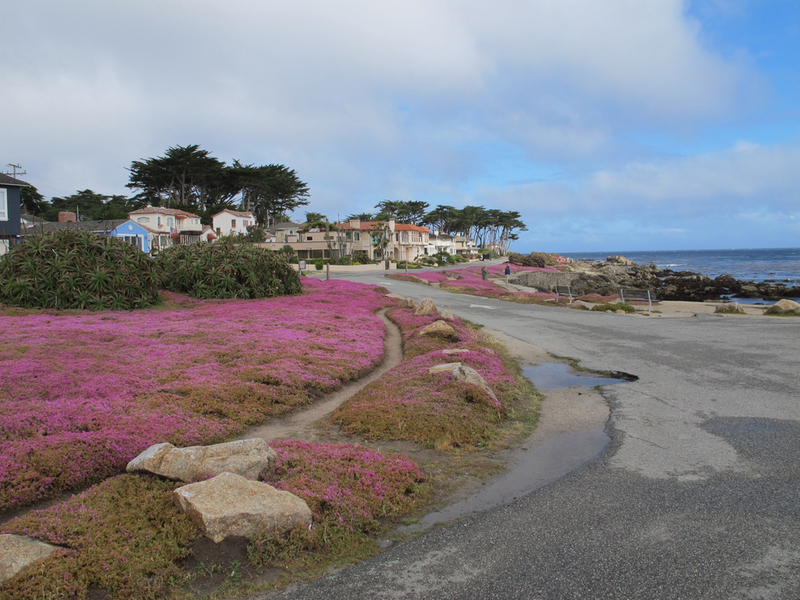 After leaving the hotel, we biked along the bay, passing the rental home in Pacific Grove where we had spent our 10th anniversary and tried to stay again later but were barred access due to a triathlon underway so we had to be relocated to a rental in Spanish Bay on the 17 mile drive that time. 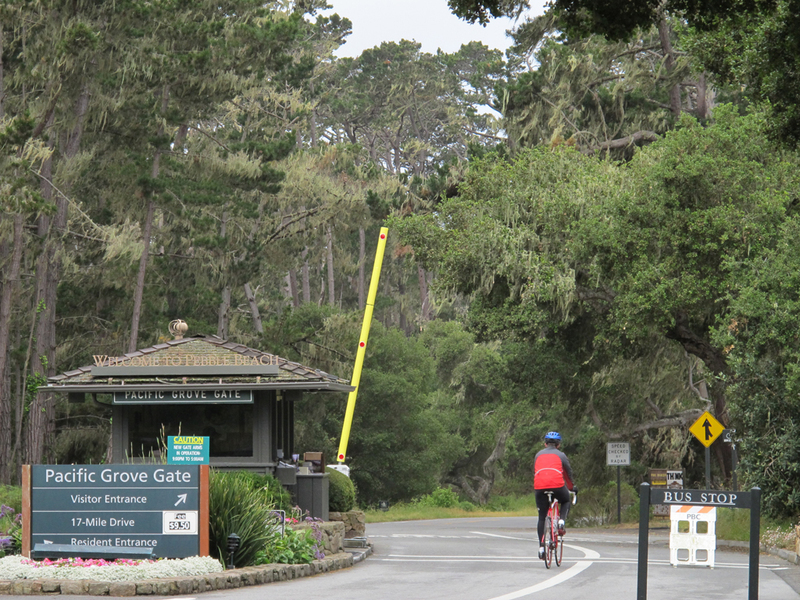 And soon we were biking the 17-mile drive which most folks pay $10 to see from a car window. 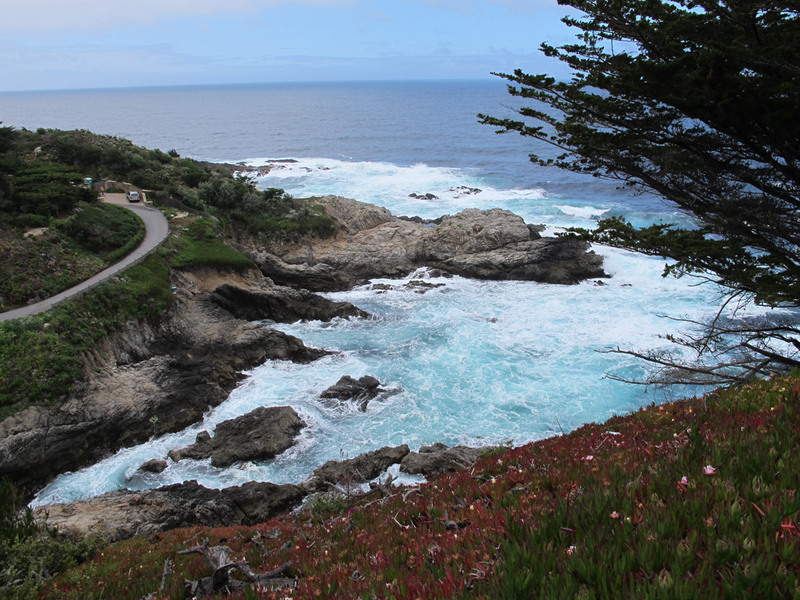 The road wound up and around through multi-million dollar estates perched on ocean side cliffs surrounded by wind- torn cypress trees. 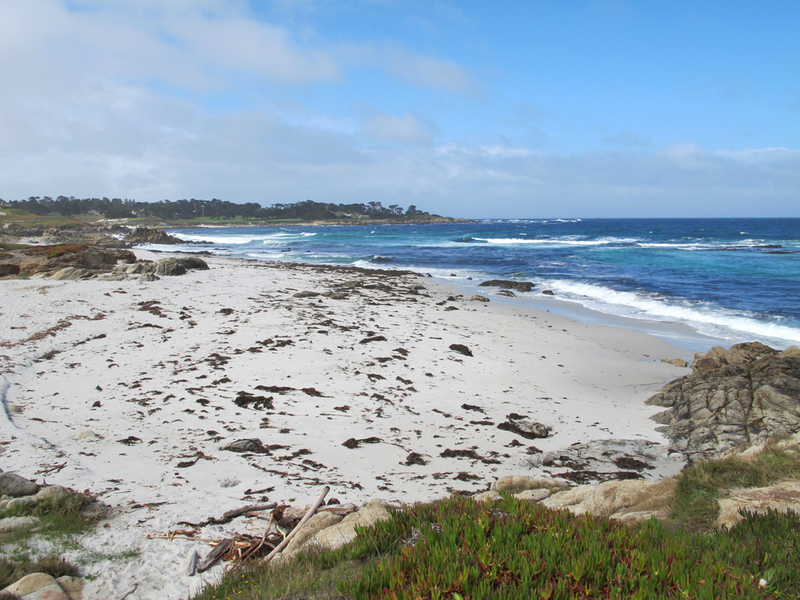 Views of the ocean were spectacular and we caught snippets of Pebble Beach on our way to Carmel by the Sea, a beautiful coastal village of boutiques, cafes and galleries. Even the Chevron station impromptu rest stop was charming! 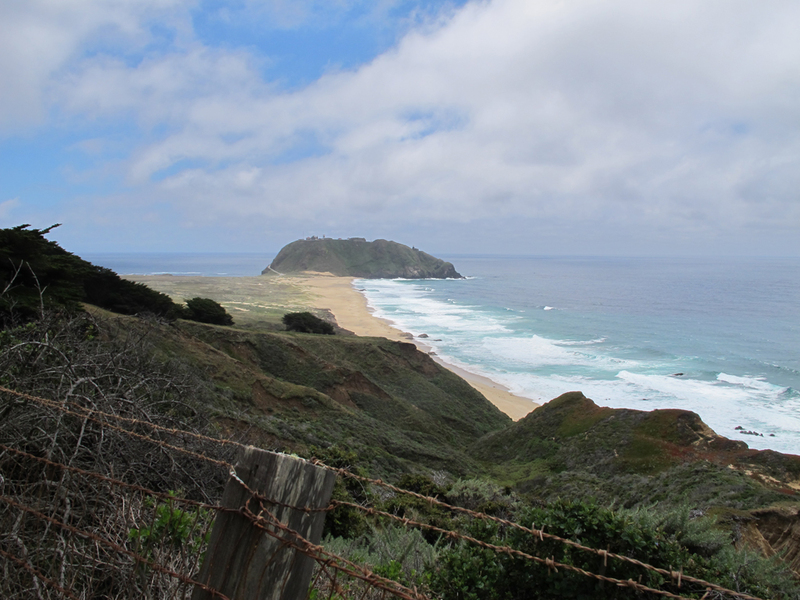 We paused at the Mission San Carlos Borromeo Del Rio Carmel on our way out of town, then caught Highway 1 for an incredibly scenic ride down the coast. The wind behind us and rain a distant memory, we road the undulating hills in awe of the cerulean waters contrasting with the vivid white breakers crashing into the rugged rocky terrain. 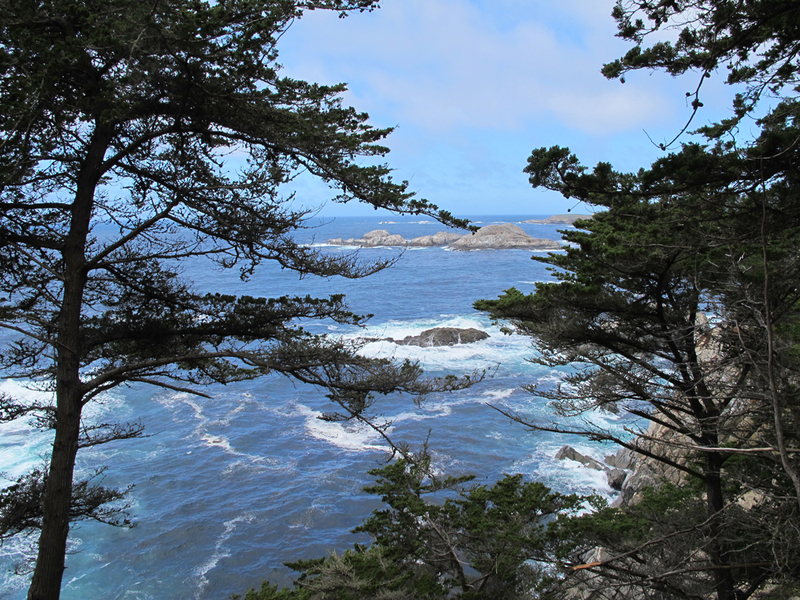 Again the moisture in the air and scents of pine and ocean engulfed our senses. 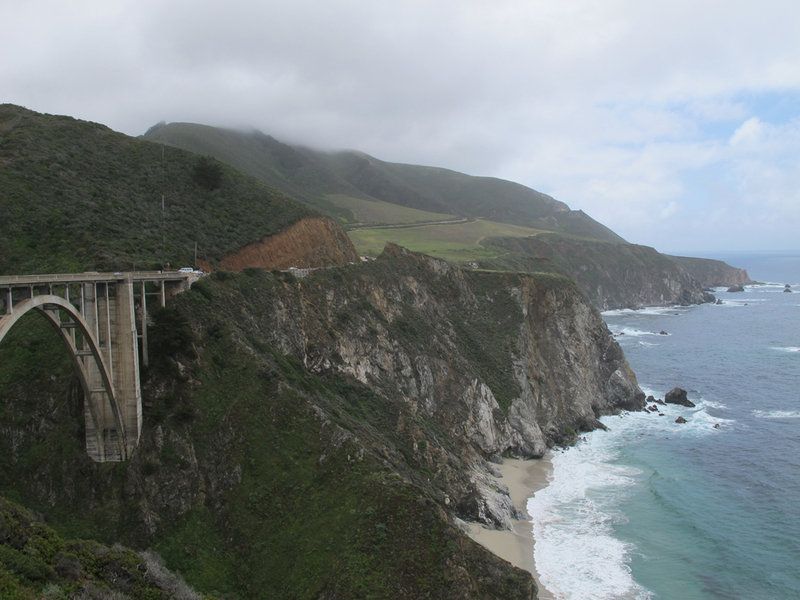 We caught our breath as the iconic Bixby Bridge came into view, knowing we would pedal across its expansive height. And we did, with Stewart pausing on the north side to photograph Anne crossing. Amazing! Once across, we ran into the road work we had been warned about. A few short pauses for the flag men to wave us on didn't faze us any, and we were happy to learn that the mud slide that had caused the delays actually re-routed the racers and 18 wheelers inland, so we were able to ride with much lighter traffic than usual. It was a magic biking day and one to thank the powers that be to be blessed with the opportunity to do this. 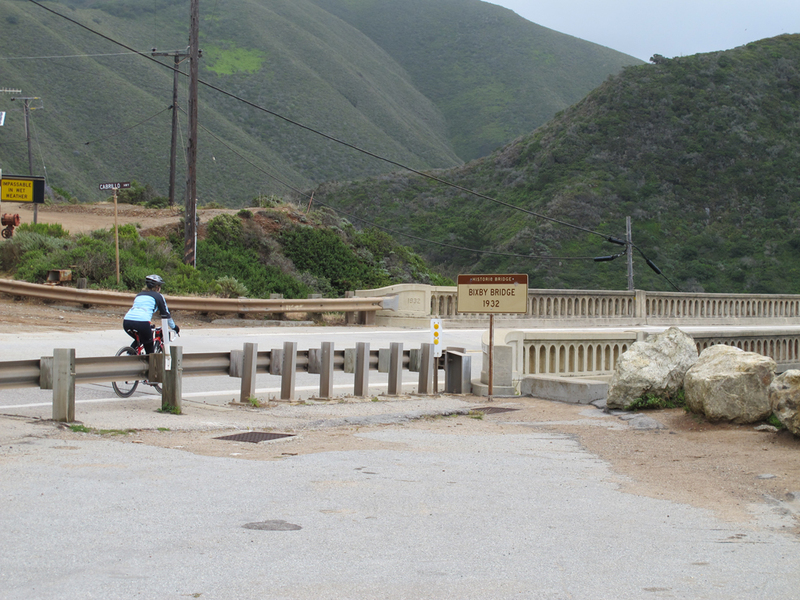 After the Bixby Bridge, we experienced a mile climb at about 6 percent grade, followed by an amazing 2.5 mile descent. It wound down and around but not too steep so while we judged our bikes' braking abilities, we could share their joy providing the closest most humans get to open air flying. 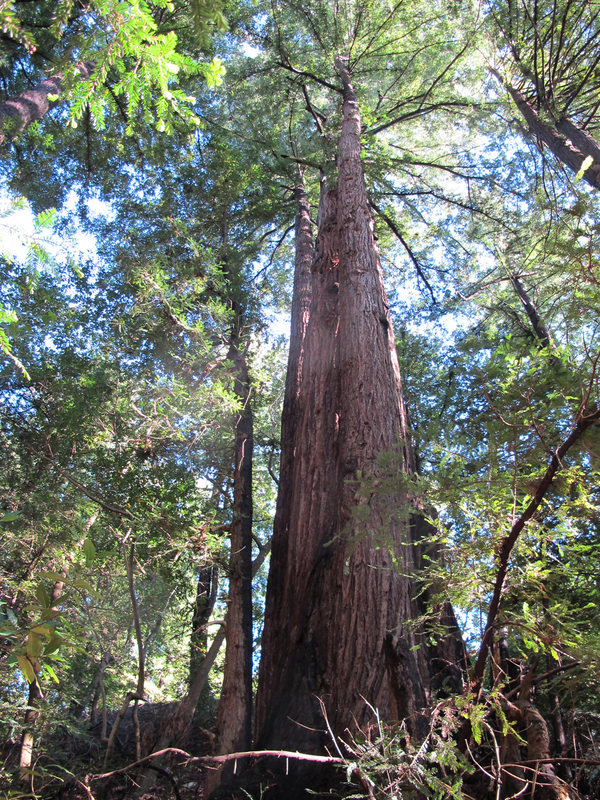 After a picnic lunch, we turned inland into a shady redwood forest that took us into Big Sur. Then the climbs really began with an 8% grade that went on for miles and miles leading to the Inn. Luckily it was stunning and Anne started remembering the words to every song she could bring to mind to distract us from our lack of granny gears. Finally a short steep downhill signalled the end of the long climb... but we weren't there yet. 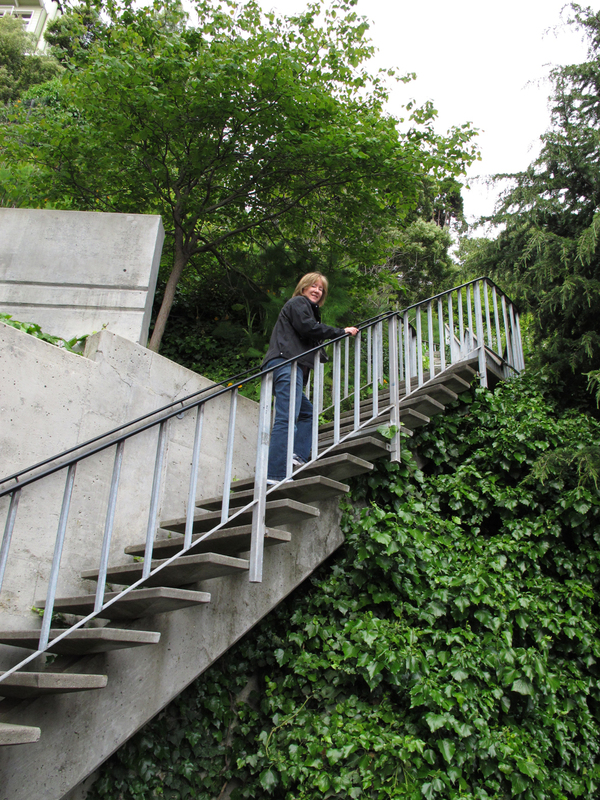 A tortuous climb too steep to read the trip computer took us on into the Ventana Inn and we were in heaven. 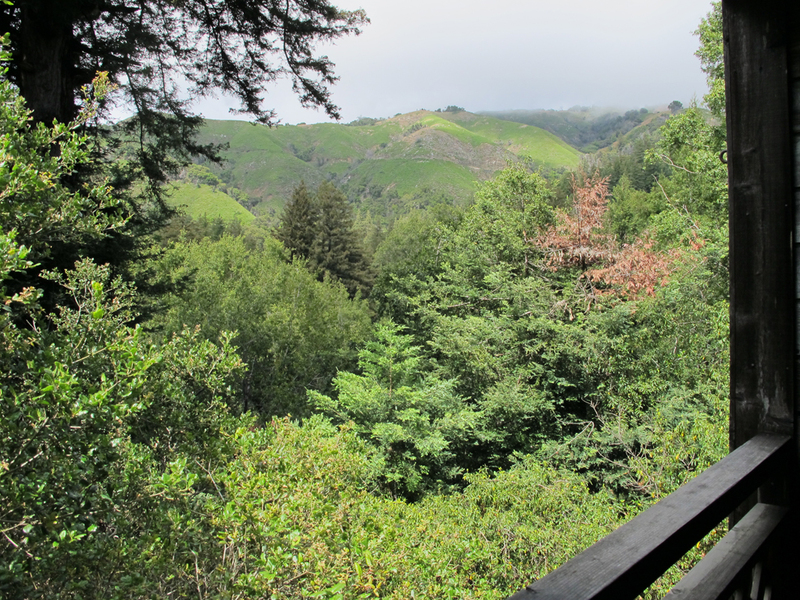 Our room was in a rustic but elegant log cabin backed into the redwood forest with stunning views of the hills beyond. The design was interesting with a wide flat shallow sink that splashed water everywhere, a wonderful deep tub with bath salts and a hand shower, and a walk in glass enclosed shower. Anne grabbed the tub while Stewart hit the shower, then we headed out to explore. The grounds were pastoral, with waterfall art and native gardens scattered about. 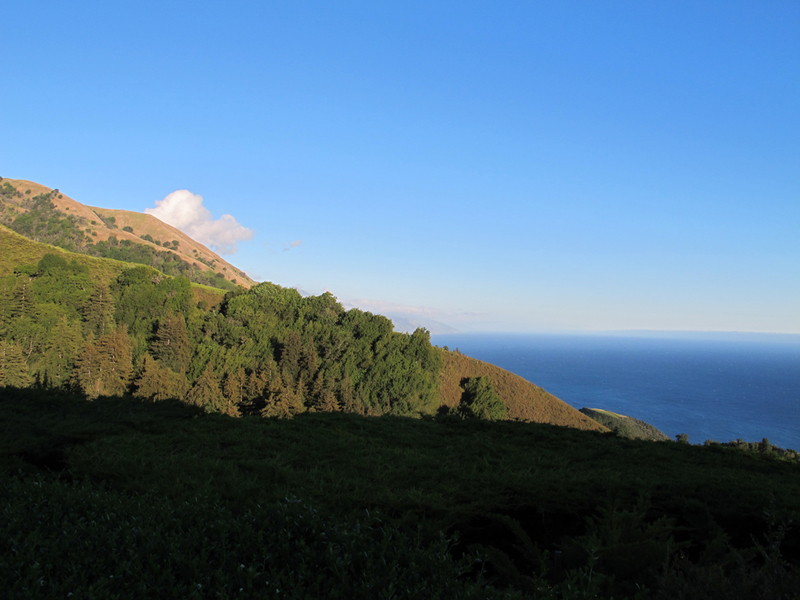 You could spy a golf green hanging off a cliff at the far end of a mountain. We checked out the clothing optional Japanese bath (aw, no bathers!) and headed onto the trail to the restaurant. 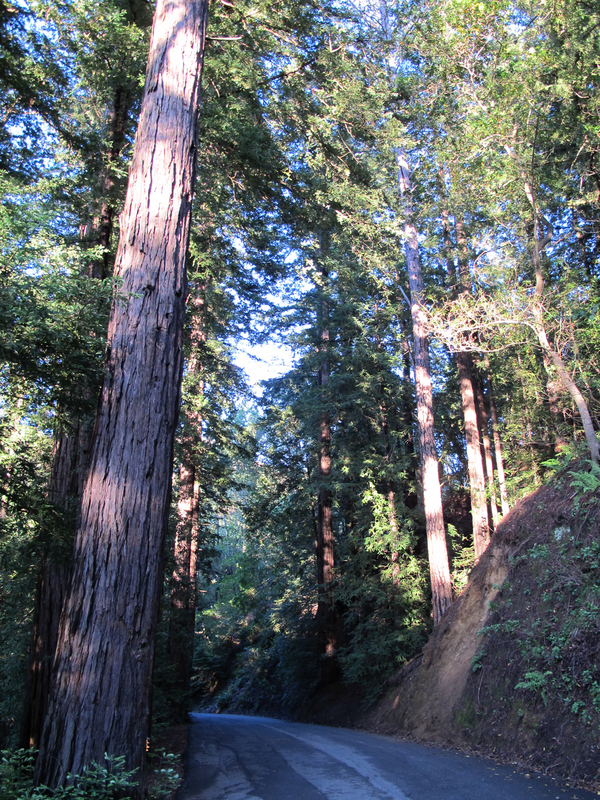 It wound through the redwood forest with the golden light filtering through the treetops, occassionally hosting a pair of adirondack chairs. We emerged at the restaurant and found a large patio with outdoor fireplace and "fancy heaters" but none lit due to the strong winds. Dinner was performance art, cauliflower soup poured from a kettle, porch chops and scallops and a shared creme brulee. 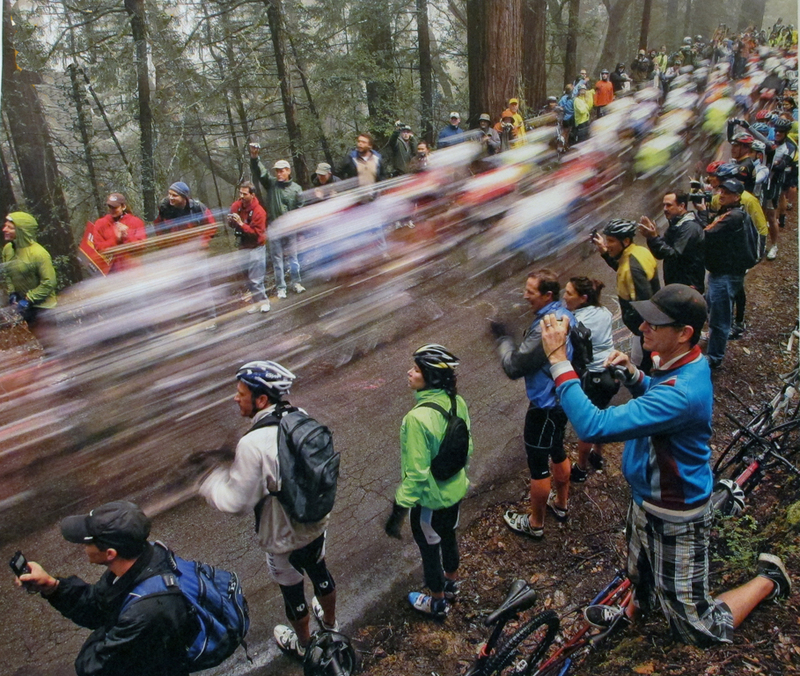 Back at the room, we couldn't get connected to watch the video but read on-line that Chris Horner took the stage on Sierra Road, a true mountain top finish! Psych! 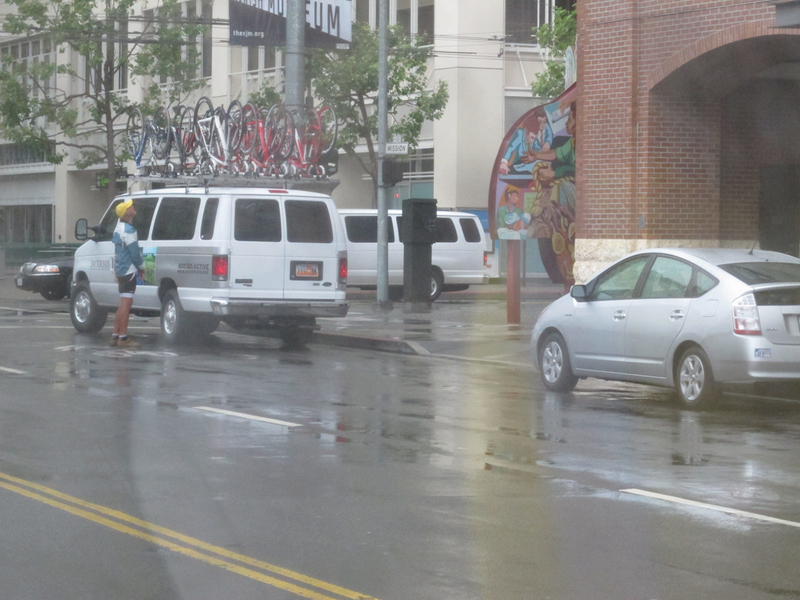 Actually, everyone opted out of cycling today. 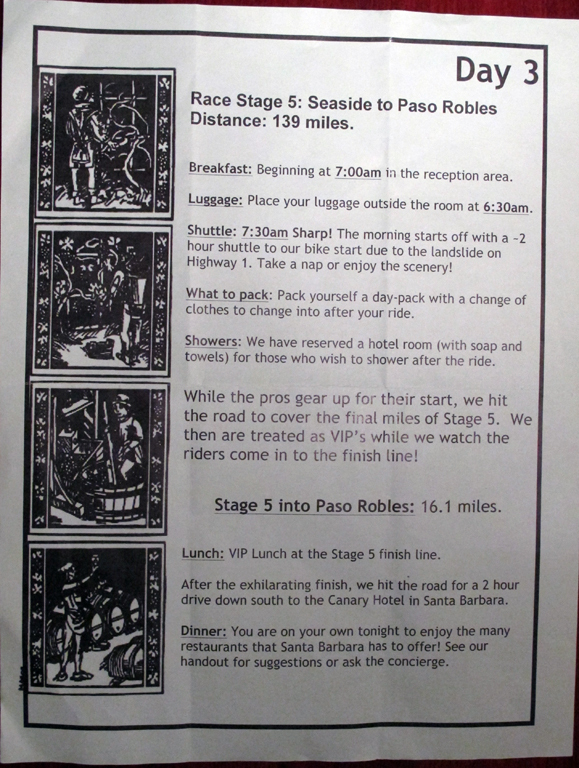 The logistics were just too complicated carrying a change of clothes, shampoo, blow dryer (which I didn't even have) to shower after the ride before hitting the VIP tent at the finish line in Paso Robles. 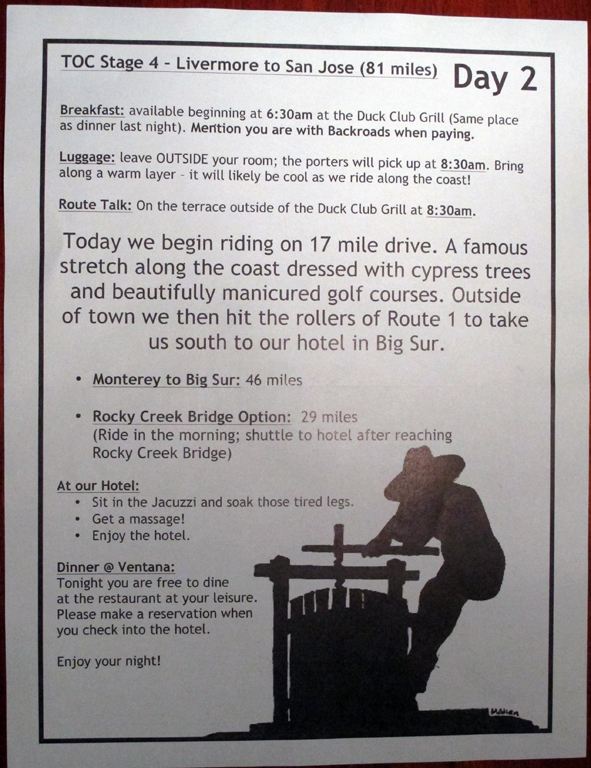 The other issue was that the cycling was epic and we were pretty spent from the ride into the Ventana Inn, especially since the racing bikes didn't have any granny gears! 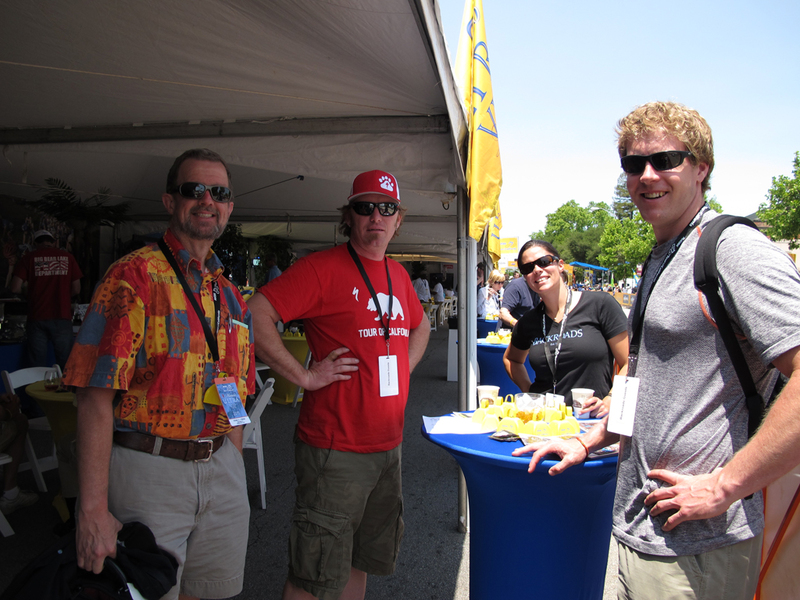 So, we got to the VIP tent early and enjoyed the tamales, enchiladas, finger desserts and yes, more Pete's coffee. Delicious! Then we scouted out the vendor booths, mulling over the jersey selections, watched the towering unicylist picking up bowling pins from kids, got our pictures green screened with the Radio Shack team theoretically behind us, sat in a Nissan Leaf, and just generally enjoyed the beautiful sunny day surrounded by happy people. 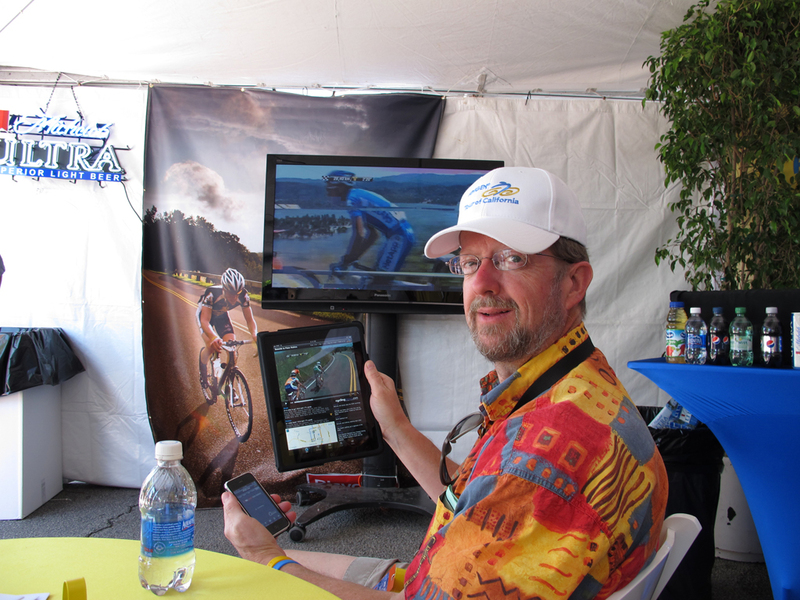 Back at the tent, Stewart cranked up his iPad Tour Tracker along with his phone app, in front of the myriad large screens covering the stage while just over the railing, the actual race was happening. We wedged ourselves into a slot outside the tent on the railing and watched the helicopters, listened for the cow bells and cheered like crazy as 45 cyclists arrived at the same time. Turns out Peter Sagan of Liquigas took the stage and we saw a Liquigas rider being escorted to the medical tent where they do the doping tests. He must have been clean since there was no follow-up negative publicity. We were so wired from the excitement, Anne took advantage of the free wine for a post-race celebratory chardonnay, a few mini-cookies and tiny key lime cheesecake. 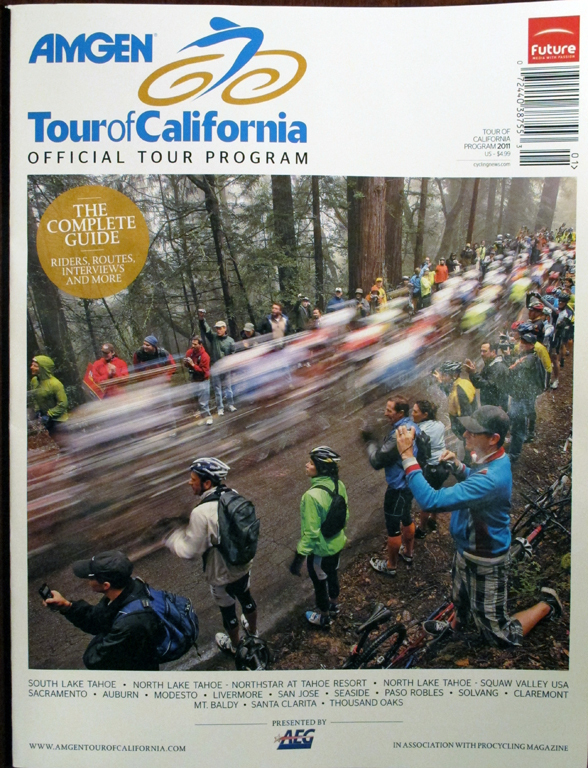 On the way out of the tent, someone handed us each a large wine glass with Amgen Tour of California etched into it. We'll have some interesting packing to do since Backroads' partners have also given us Specialized jerseys, full Bicycling Magazine kits (jersey and shorts), Giro gloves and helmets! 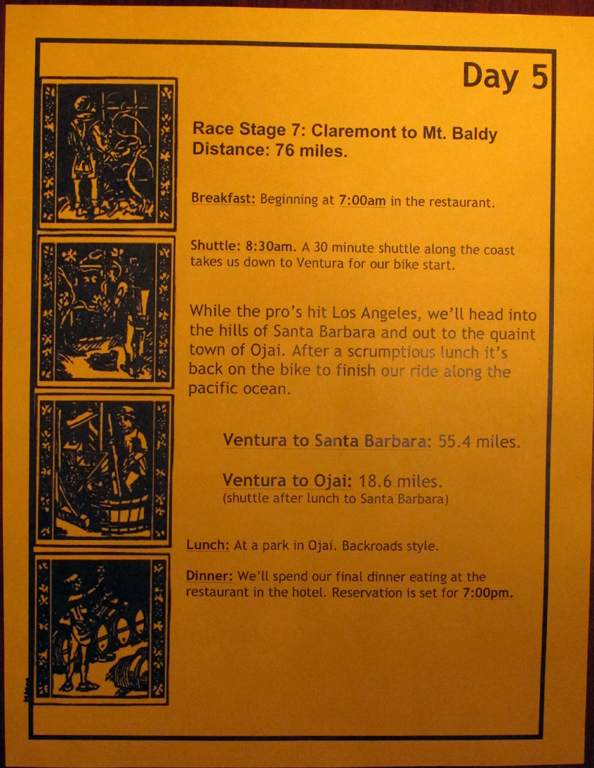 We shuttled into Santa Barbara where we checked into the Canary Hotel, a nice place in the heart of the city. It was an older hotel but well preserved, although the maze of hallways played havoc with the A/C so it was always freezing just outside our door, but fine inside. The room was small so our plan to let the suitcases explode for the three day stay here didn't materialize so well. And the bed was way too tall! Anne had to jump to get into it. They had a small foot stool but we were afraid of tripping over it in the middle of the night so we stashed it away. This night we were on our own for dinner and although Backroads provided several suggestions, we just wanted something quick so we walked around the nearby outdoor mall (Paseo Nuovo?) and took the recommendation of a security guard who could tell we were lost. We went to a nice Italian restaurant around the corner and took a seat at the counter. The woman behind it (we'll call her the owner) seemed to know everyone who came in and quickly made us feel at home. 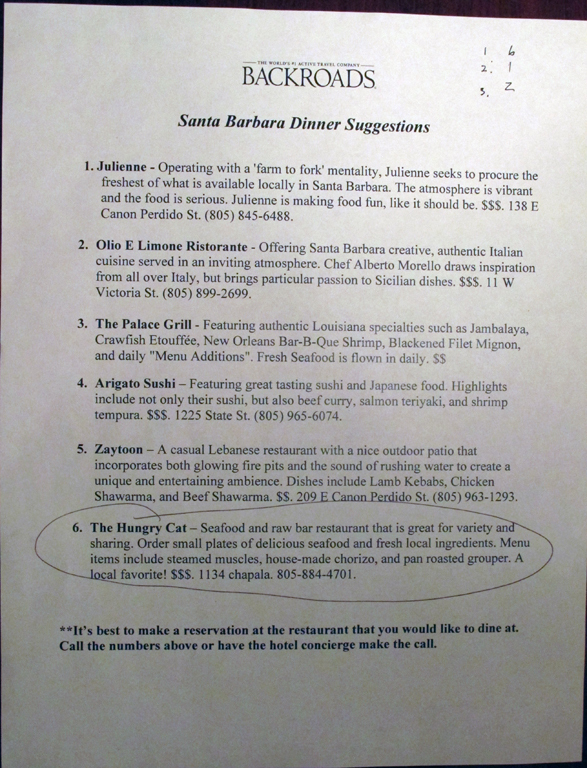 We placed our orders, then Anne requested some suggestions for places to see in Santa Barbara from the single woman who had some in and sat next to her. She was clearly a local since the owner asked her about her job (ex-job it turned out) and the guy she's seeing (about to be ex-guy too since he's apparently never home). She was happy to make some suggestions including the trolleys that tour the city then head out into the water. We didn't try it this trip but will have to do that some time. She was very southern California with perfect makeup, nails and jewelry and a slight line on her nose that may have been a nose job. Again, fun people watching. We ate our meal and headed back to the hotel past the outdoor theater that was showing ET. Unfortunately, Anne's over-full feeling (despite eating only half of her pasta) turned out to be a bad reaction to the meal and about 1am it woke her up and made its exit. She immediately felt much better. Unfortunately again, Anne's morning coffee didn't stick either. Bummer!!! 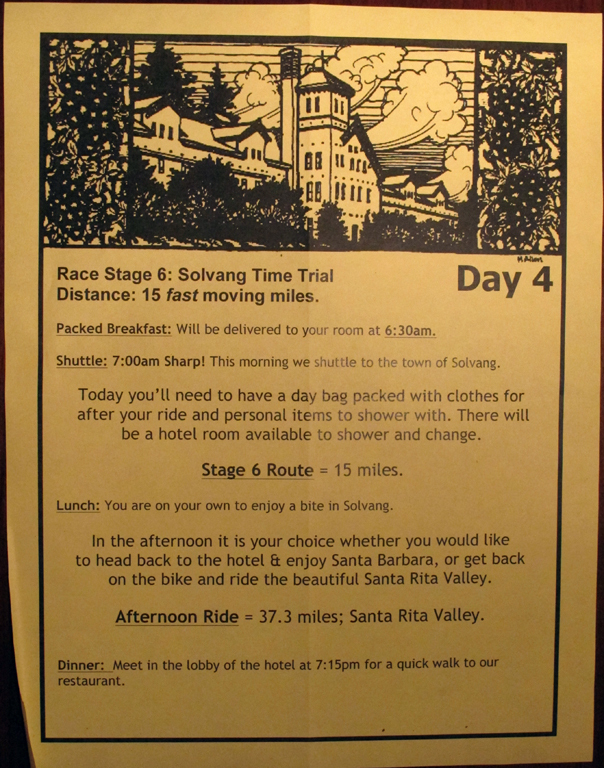 She was so looking forward to riding the Time Trial route in Solvang. Stewart was afraid she might spread a virus on the van shuttling us into Solvang but Dan asked her a series of questions and detemined due to lack of any other symptoms that it was a food reaction. He recommended lots of Gatorade to avoid dehydration and provide some nutrients in lieu of other sustenance. 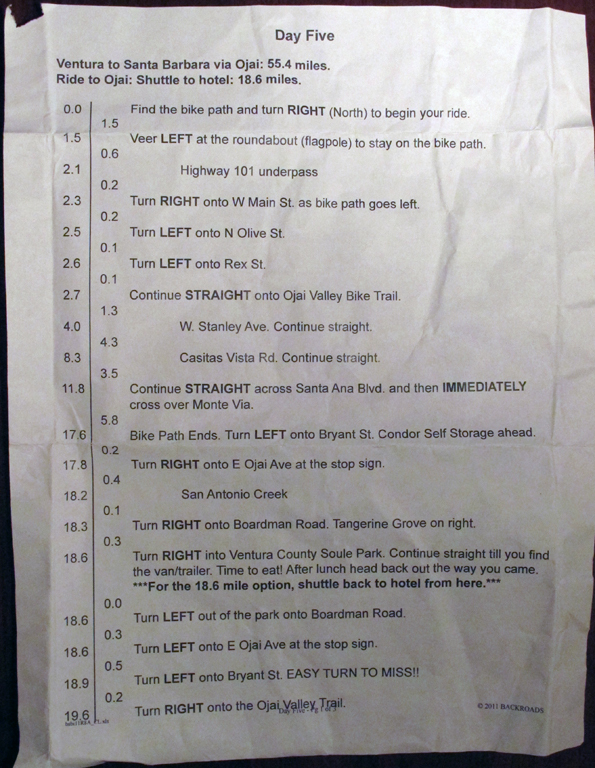 So we went on in to Solvang and rode the beautiful course. It was 15 miles and had some lovely stretches near horse ranches, then undulated into a few short steep climbs with a nice long winding downhlll toward the end. There were lots of other cyclists taking their stab at the route, and even a fully kitted out Radio Shack rider warming up who lifted his fingers from the handlebar for a quick salute as he flew past us. Since Anne was under the weather and riding without dinner or breakfast, we didn't worry about our time. But when Stewart flew down the winding road gaining quite a bit of distance on Anne, she remembered reading that the sports journalists predicted the winner would be the person who took the straightest line in the downhill. So, she flew straight down the hill as Stewart zig-zagged and nearly caught him by the bottom. She was incredibly lucky that no one was coming the other way because the road was not closed and the straight line approach required being in the wrong lane half the time! 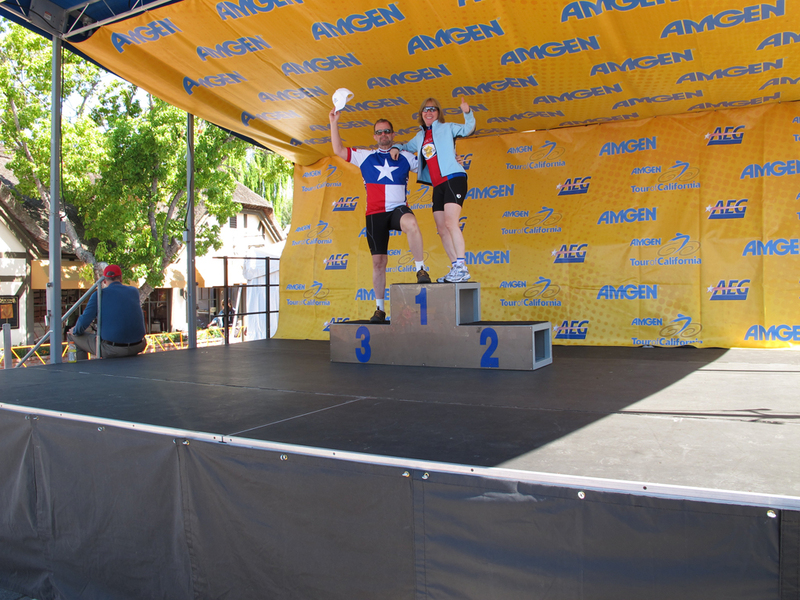 The racing bikes had their finest day in Solvang but Anne found that the minimal tread allowed some skittering effects especially when over-correcting on the left turn at the bottom of the hill that was a little too close to the curb. We have a much better appreciation for what the racers deal with now. And they finished in easily half the time it took us. At the finish, Dan got Anne to eat a banana which he said would digest easily, and it did. 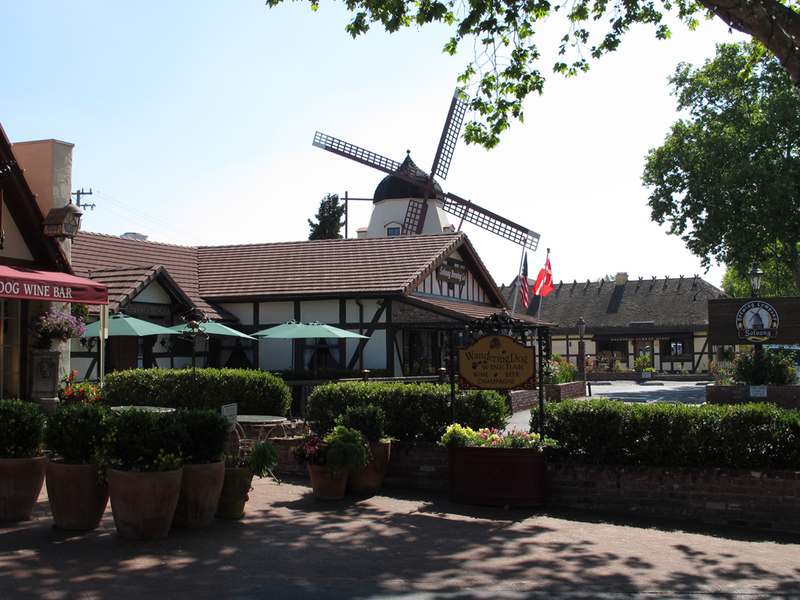 She felt much better and had no other issues so we went on into Solvang and walked the streets among the vendors, team buses and beautiful Danish architecture including the iconic windmill. We found a wonderful cafe where crepes were their specialty so Anne tried a peach crepe while ignoring Stewart's patty melt. Then off to catch the action. First we stopped by the Specialized bus where Ian and Alex (a former Backroads leader) got us access to the deck on top of the bus. Stewart posed for a pic while we checked out the view from above. Not a great sight line to the finish line, so we left the bus to the Specialized guys who were obviously hoping for a spot on its railing and headed out in search of more sights and a better view. 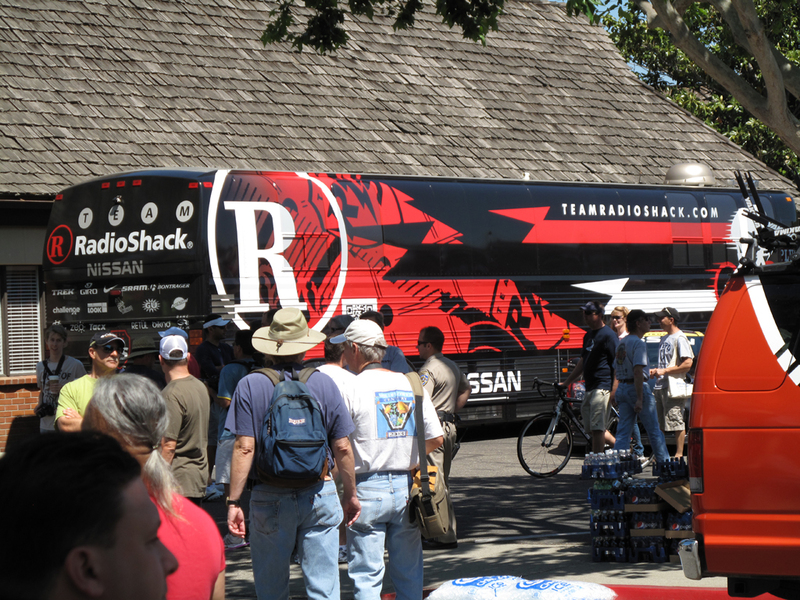 We were hoping to see the riders warming up on their trainers and while some teams like BMC were front and center with their warm-up, Radio Shack hid their team behind the buses. 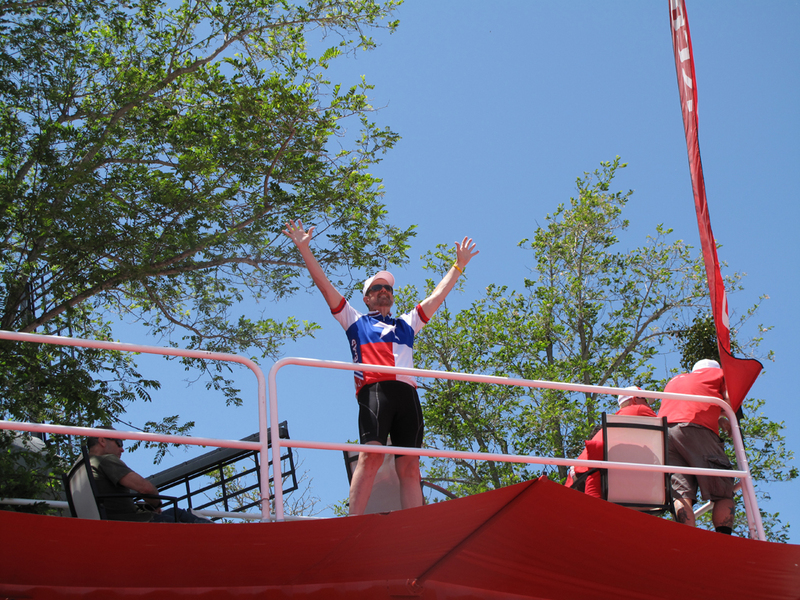 But we got to see Bob Roll hamming it up with the guests, and caught Chris Horner coming out of the RS bus. 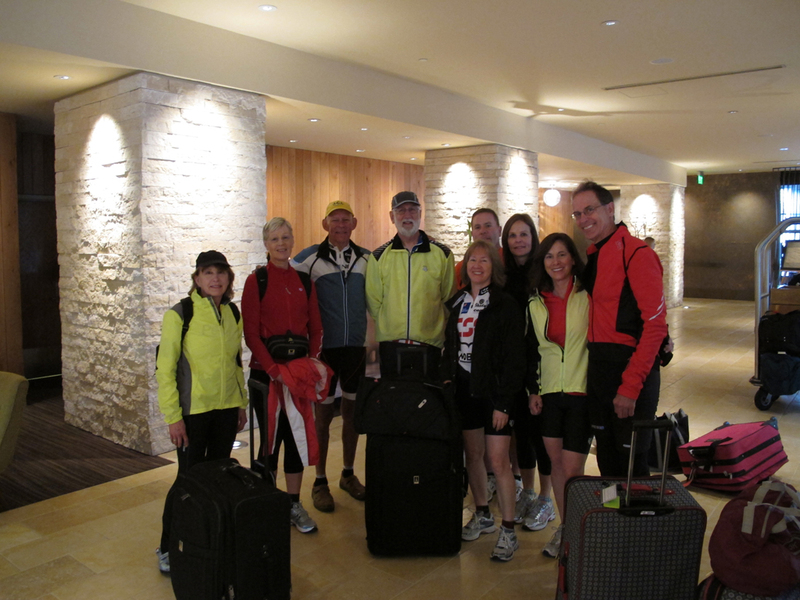 We ran into Rich and Teri who had gotten Phil Liggett and Paul Sherwin's autographs after they wrapped up a video! Then we saw Laurie taking a picture of John who had climbed on top of the podium #1 spot! We loved that idea so we all climbed up and got pics of each other. That was fun! The start and finish lines were just one block apart since the Time Trial route was a loop so we checked out the action as the riders at the end of the standings left one minute apart. Then we roamed the streets watching the racers rolling among the milling bicycling tourists, and listened for the race progress. We could hear the announcers but not what they were saying. So we stopped in at the Radio Shack tent and tried to watch the Liggett/Sherwin coverage for awhile but with no seats it was getting tiring. So we found a nice gelato shop (Anne was still avoiding milk-based foods) and took a seat in the square and just enjoyed Solvang for a bit. Finally, we found a nice spot on the railing not too far from the finish line were we could make out the number and time of each rider coming in, and could get a long sight line on the rider just making the last turn toward the finish. The woman next to us was checking off each rider on the ordered list, and her son was a font of knowledge ("Here comes the Time Trial champion of Luxemburg!"). The cowbells tipped us off as each rider was reaching the last turn, so Stewart held his video camera high and Anne tried to snap off some stills as they flew by.... not always successfully. ("Well, there's another empty picture"). The tension built as the fastest times fell when the highest placed riders started coming in. Dave Zabriskie held the fastest time at 30'35" (yes, half an hour for 15 miles!). 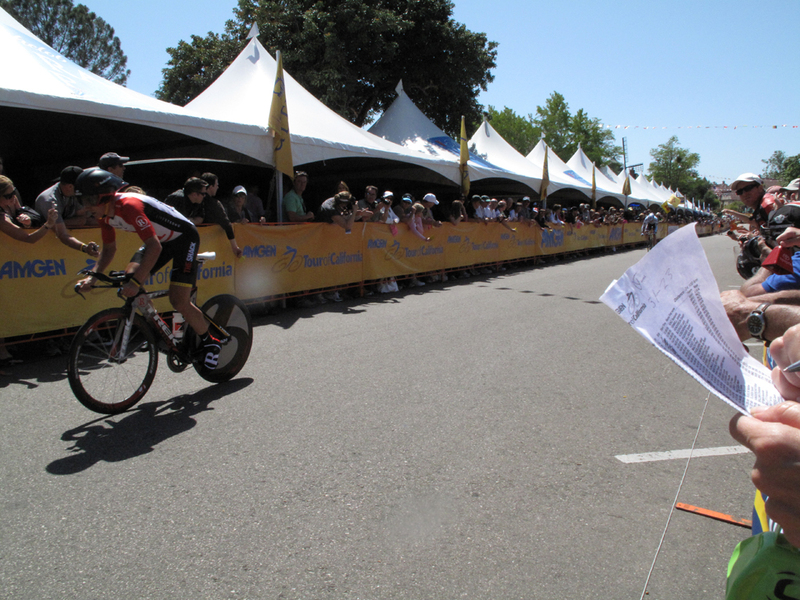 Levi Leipheimer had a great ride too but despite having won this stage each time they used this route, he came in second to Zabriskie at 30'49". 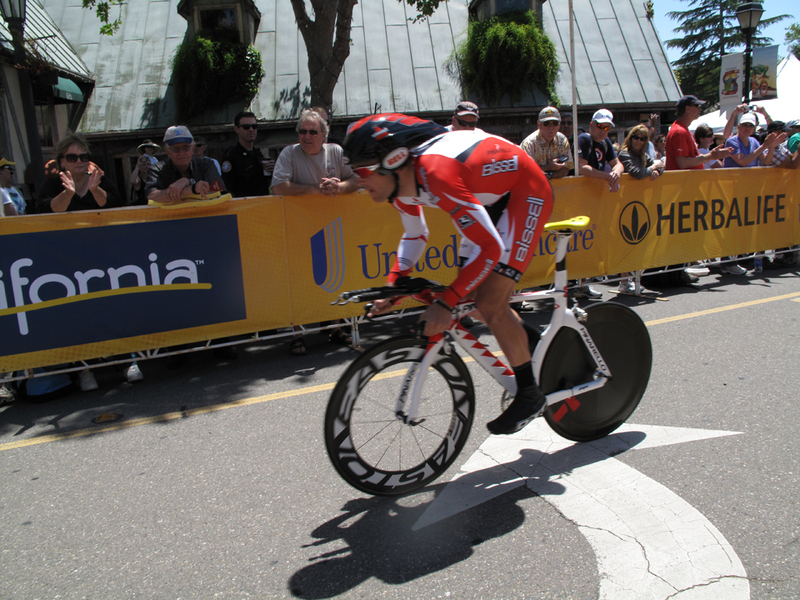 But the biggest surprise of the day was that Chris Horner did a fast enough TT to retain the overall lead!! He had built such a large lead, over a minute, on the Sierra Road day that even a great TT couldn't beat him. Amazing! After the Time Trial, we hopped back on our bikes. There were both long and short options available and everyone else had opted to pass on actually watching the race and went cycling instead. Backroads had botched the logistics of the Time Trial asserting that since it started at noon we could be back at the van at 1:30 for the shuttle to the ride starts. But it started at 12:45 and with 144 riders leaving one minute apart and taking 30 minutes to finish, it really wasn't over until almost 4pm. So those that wanted more cycling left early. We decided to just do the short option since dinner was at 7pm. 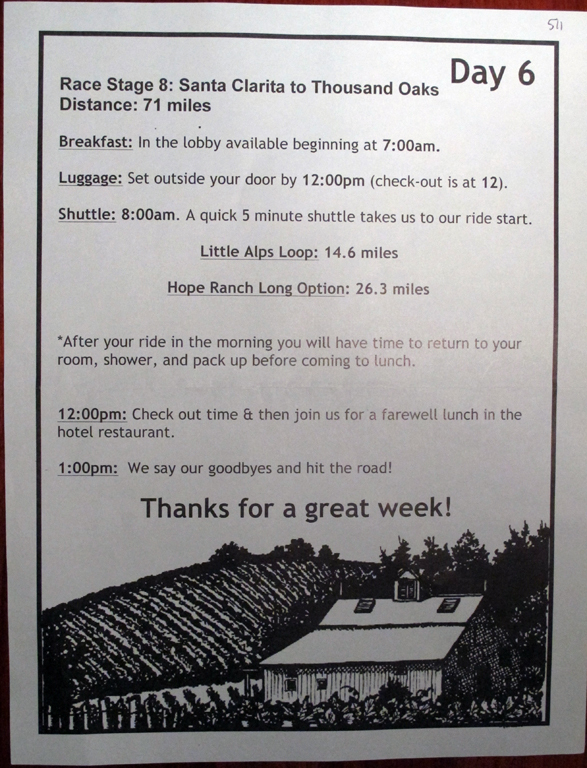 It was a beautiful ride, with rolling hills past vineyards and horse farms. The mustard fields were intense yellow against the bright green hills. We climbed and climbed, took some pics, flew downhill and enjoyed it ... to a point. The road surface was really rough and we had a major headwind. The temps had started to drop back into the lower sixties and Anne was getting a bit chilled and thought about stopping Dan in the van to get a jacket on, but then realized she had just spent a very active day on very little to eat. Plus it was getting later and later. So, for our first time on a Backroads trip ever, we put out our fists to stop the van. Dan was there in no time and we shuttled back to the Canary Hotel. Dinner that night was a few blocks' walk from the hotel at Bouchon. It was a small restaurant with one room reserved for our group. 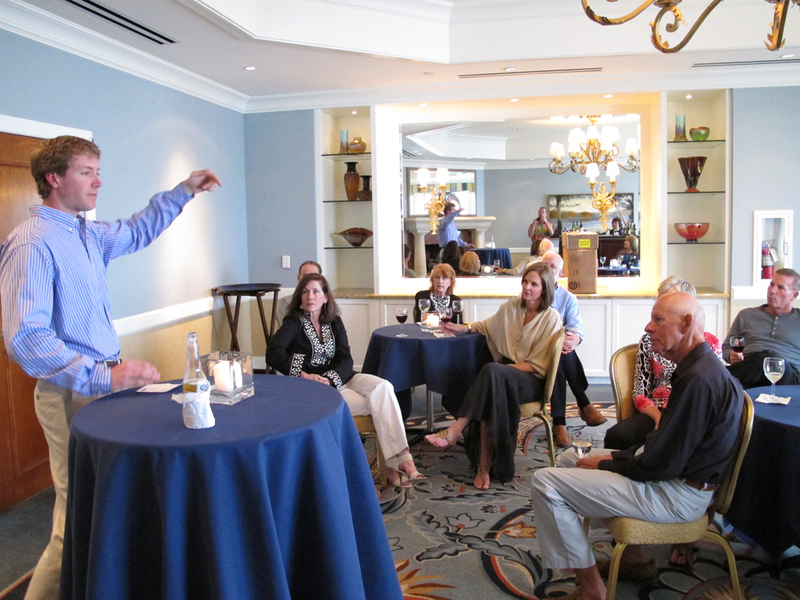 A large table was set up to hold the 10 guests and 2 leaders so we settled in to order. The wine menu only listed bottles and they said they "recommended" that we order by the bottle rather than the glass. Since the logistics of paying off strangers for a share of a bottle when you only want one glass was not worth the effort, we passed on any wine. They gave a nice speech about a local wine with multiple grapes and poured samples to pull us in but that was enough for us. The room was very nice decor and seating but the sound level was such that it was very difficult to hear each other. The meal was Pumpkin Puree with Halibut and a nice chocolate cake with molten center. It was very good and Anne was all better! Today we again opted for the shorter route for two reasons: to see Santa Barbara and to ship back some of our luggage (new helmets and large wine glasses, plus a full suitcase of dirty laundry). 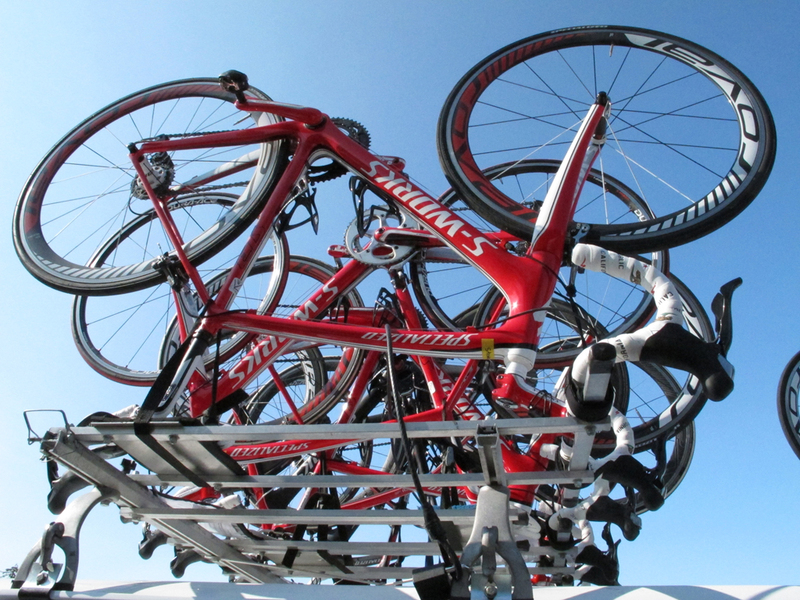 Stewart had been hoping for a more forgiving mount so we asked the leaders about the extra bikes on the trailer. Turns out they had a Roubaix in Stewart's size and after some fiddling to get the brakes working, he was on the "new" bike. 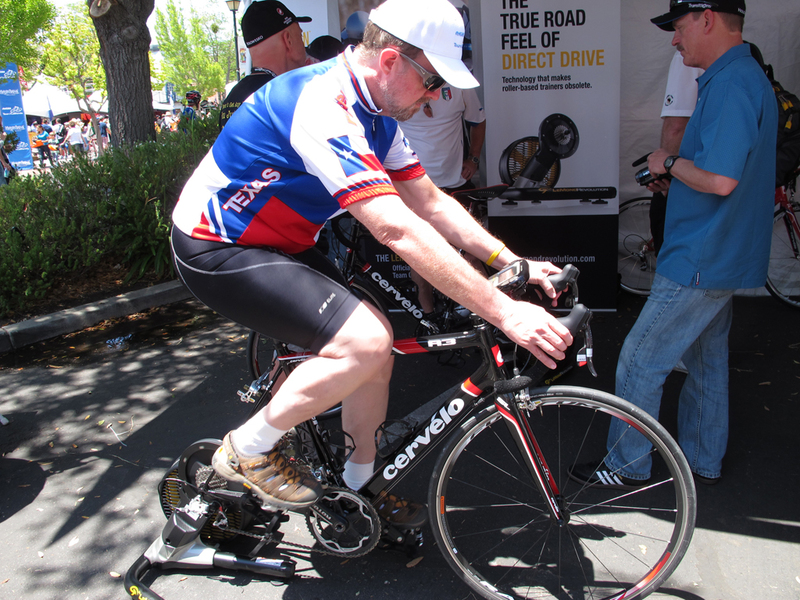 And it was definitely more comfortable than the Tarmac, but had new shifting technology so it took some getting used to. 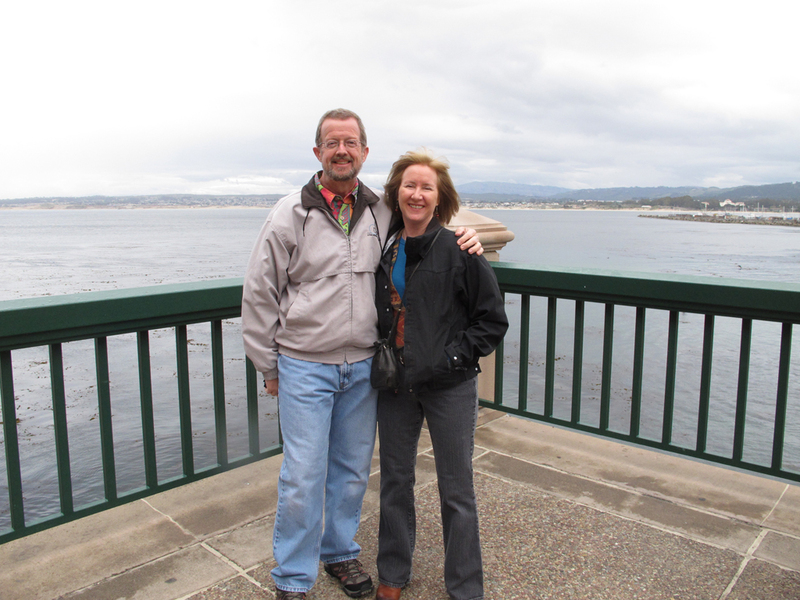 We headed out of Ventura in the fog, running along the grey coastline which was very reminiscent of a trip we had made to visit Jeanie and Chris when they had lived in Ventura. 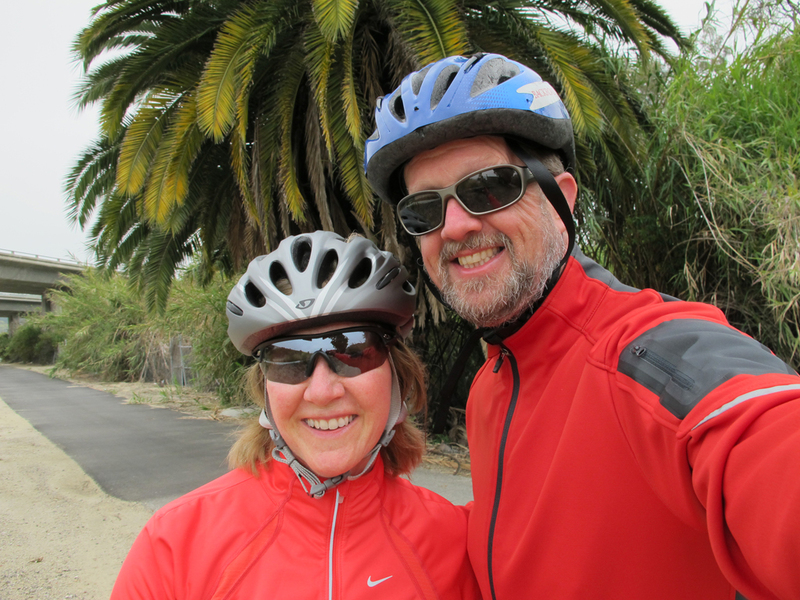 We were re-routed at one point due to sand on the bike trail so we rode some of the streets in town, then got back on the trail and rode among the majestic ancient palm trees and Mediterranean mansions. It was somewhat surreal with the opulence interspersed with a lot of homeless people. Interesting sights popped up along the way, including an MG car show just right there by the ocean, a "sculpture" of stacked stones, and several occurrences of homeless peoples' ingenuity encouraging people to see if they could throw coins well enough to hit their specially designed cups. As we got further from the ocean, the bike trail wound through a post-apocalyptic landscape with vestiges of former industries strewn behind warehouses among the palm trees. Bizarre. 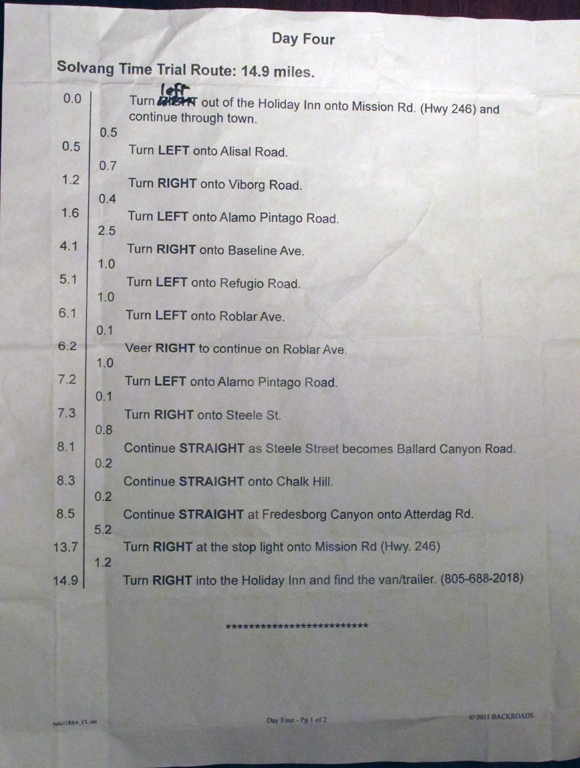 Eventually it evolved into newer residential areas and although we crossed streets several times, we found that the traffic really did give us the right of way. Apparently it's the law in California and the residents really do abide by it. 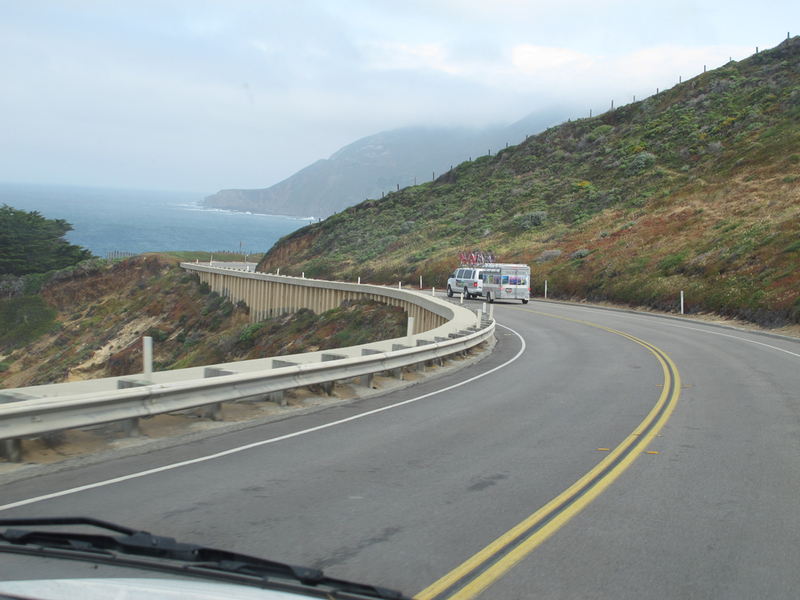 There were several twists and turns, some climbs and swooping downhills and had it not been for the appearance of the Backroads van at critical junctures, we would surely have gotten lost several times. 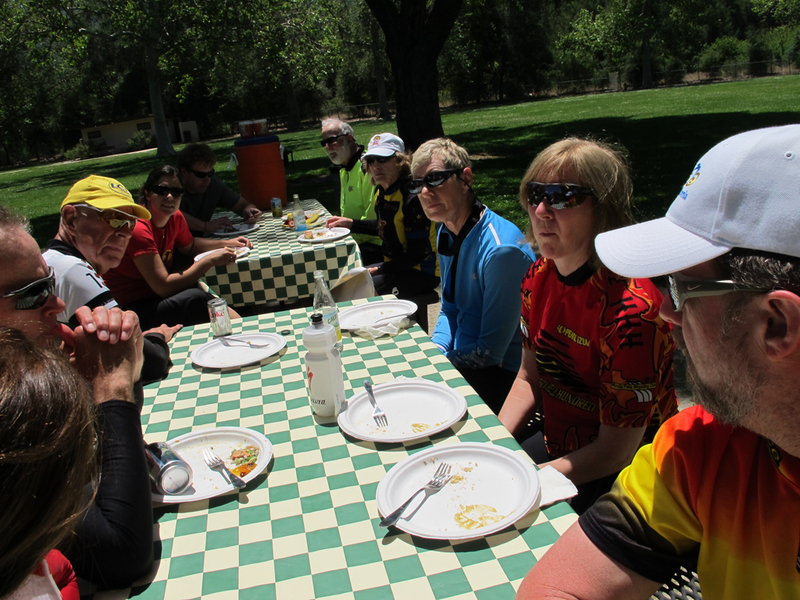 But we made it to the state park for lunch (turn right at the tangerine grove!) and joined the rest of the crew among the picnic tables, enjoying the wonderful salads and sandwiches that Dan and Rebecca had prepared. Anne took advantage of Rebecca's recommendation of ginger beer to solve any residual stomach issues and it worked nicely. She was about to comment that she deserved the Amgen Breakaway from Cancer Most Courageous Rider jersey for having done the Time Trial route under the weather, but then Rich came limping in with bloody knee, torn jacket, blood blister above his eye brow and various other contusions. Turns out he had fallen just as he and Teri were making their way into the park, and not at a very fast pace. Just hit a pothole wrong and landed in gravel. Bummer. We heard Phil Liggett and Paul Sherwin comment that the slow falls actually often hurt riders more than the faster ones. Go figure. 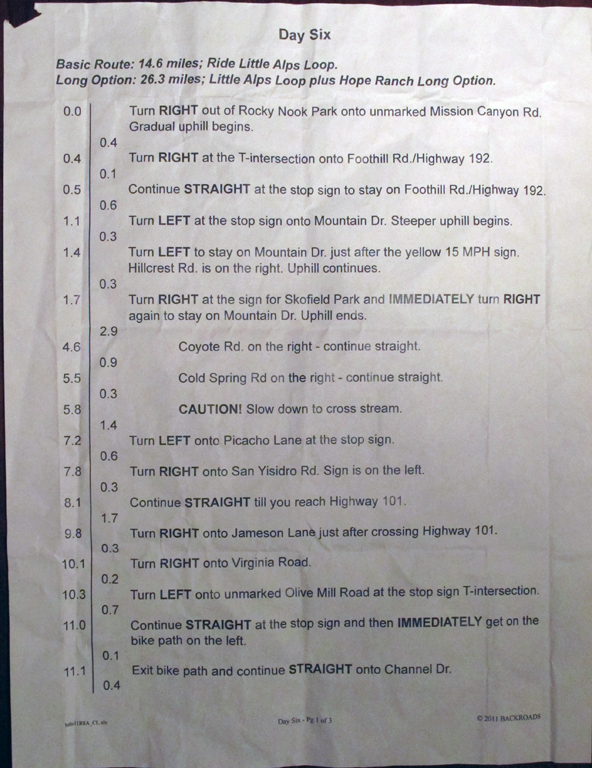 The longer route option was described as "Epic" and in Backroads speak, that means "You will die". So we didn't feel too bad about missing that. Rich wanted to do it but Teri wouldn't hear of it after his fall. 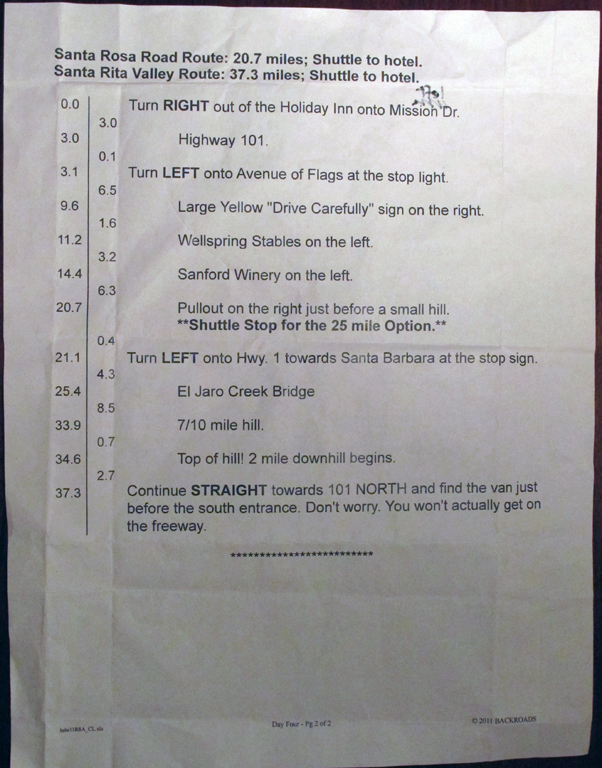 And Jeff and Pam wanted to see Santa Barbara. Anne was new to the hills so she opted out as well, leaving just Teri and Tom to do the long route (3500 foot elevation gain). We left them to it, returned to the hotel and packed up our stuff. We found a UPS store a few blocks away and hustled to get there before they closed at 3pm. They shipped the luggage as is (would have cost us $25 per bag even on the airplane anyway) and boxed the helmets and wine glasses for secure shipment. Our return trip just got much more relaxed. 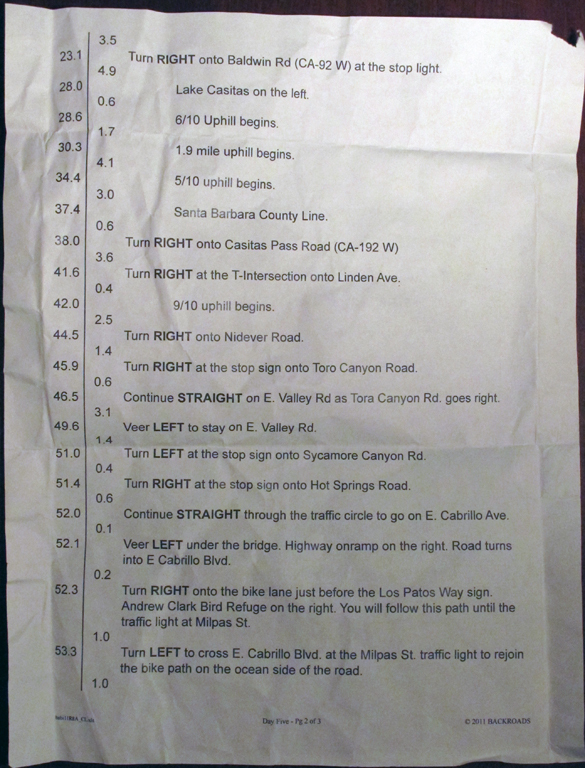 So off we went in search of Santa Barbara. Stopping the first passer-by to ask where to find a Starbucks, he said "Everywhere" so we just kept walking. Not having seen one a few blocks later, we stopped in a wonderful local coffee shop and had the best mochas ever. As we left, we noticed a Starbucks across the street! We decided to walk the street to the ocean and discovered that State Street was the main drag. Again the people watching was great, both homeless and not, with mohawks and Biebers, capris and shorty short shorts, piercings and tats, jackets and sandals, jewelry and bangles. 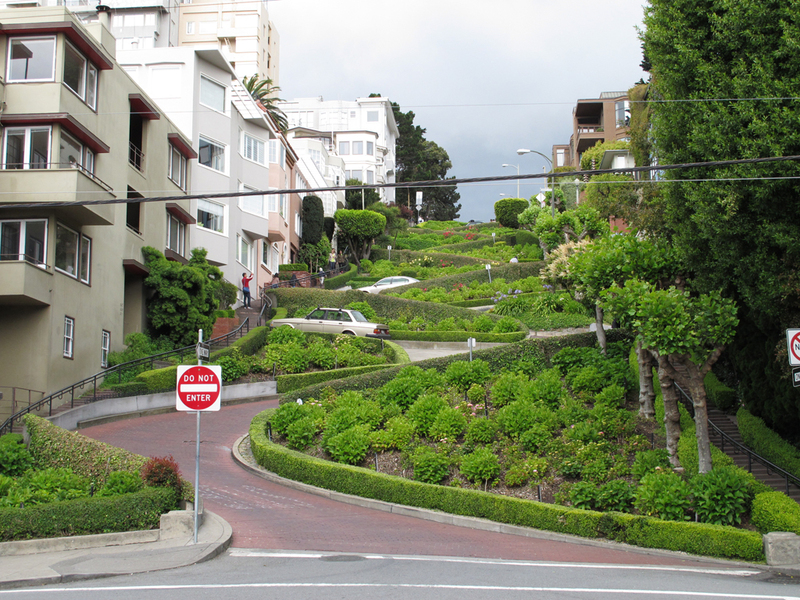 After a while we noticed we were getting further from the ocean and Stewart admitted that the diamond angle of the streets totally confused his orientation system. Anne did better with her milestone navigation techniques and soon we were headed where we meant to go, although we didn't mind the extra show. 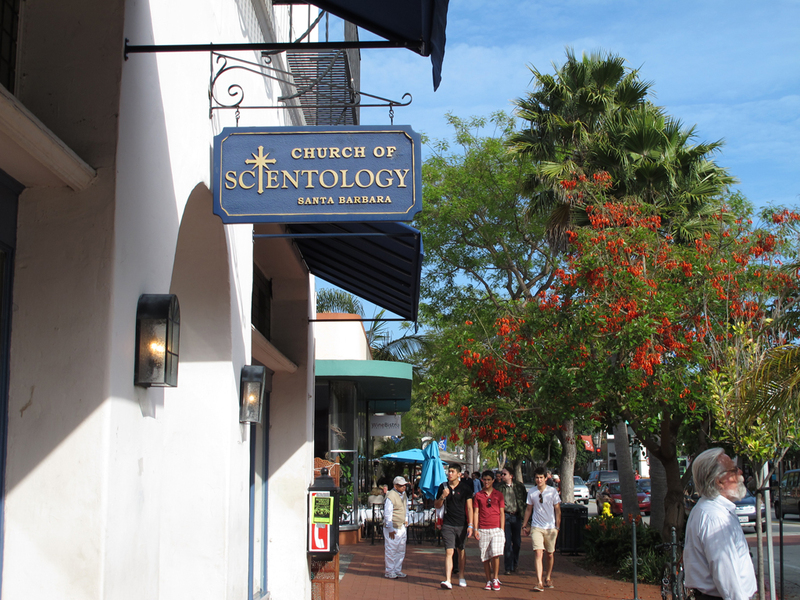 We passed the Church of Scientology, Territory Ahead and a plethora of coffee shops, galleries and museums, and folks gathered at the outdoor cafes speaking a wide variety of languages. 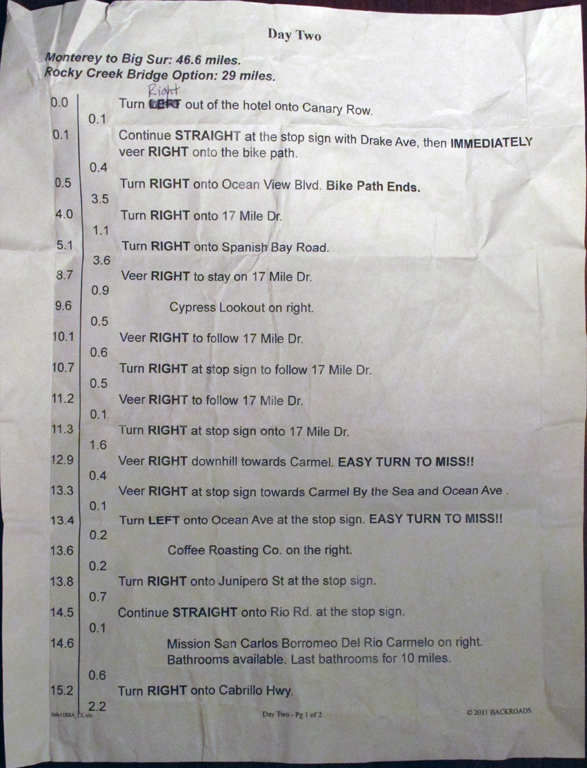 And everyone followed the rules at the intersections, waiting for the proper signals before crossing. It reminded Anne of the desserted streets in Backnang, Germany on Sunday afternoon where the few pedestrians would wait patiently for their turn despite the lack of vehicles. 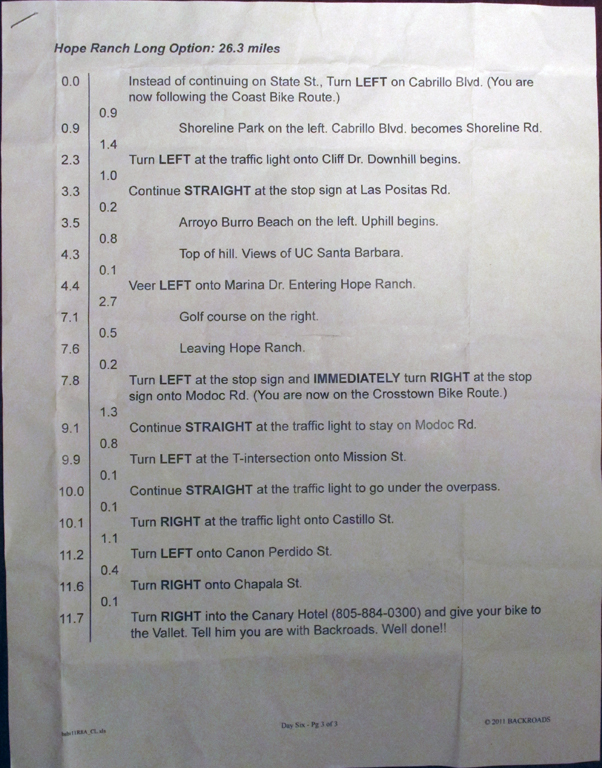 In Santa Barbara, however, there was no lack of vehicles, including bicycles, motorcycles, Ferarris, and even surreys. And every street was decked out in beautiful but somewhat bizarre landscaping, including the Naked Coral trees and lavender blooming jacarandas. 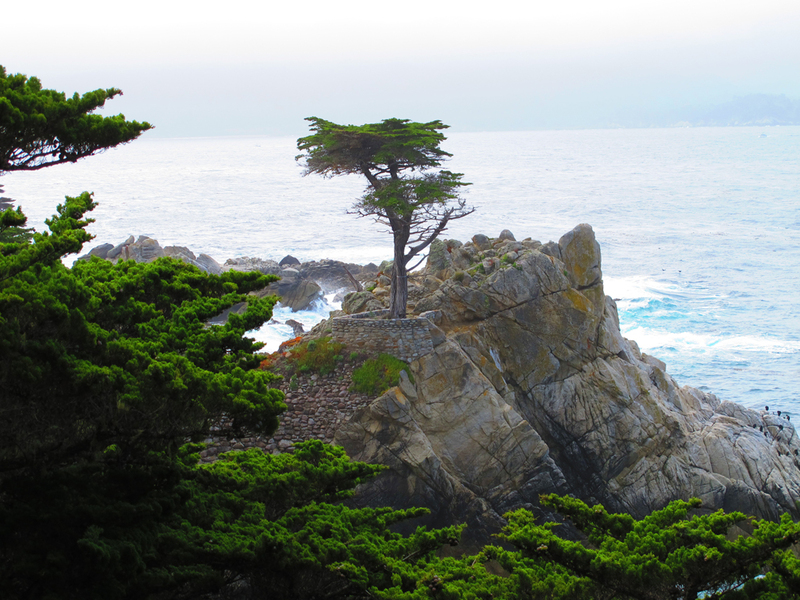 It turns out Santa Barbara has 456 varieties of trees! Once at the ocean, we walked on out to the edge of the pier, with families enjoying the cool wind in the now 80 degree weather. There were sailboats, freighters and kayaks and city views stretching off both sides of the pier entrance. 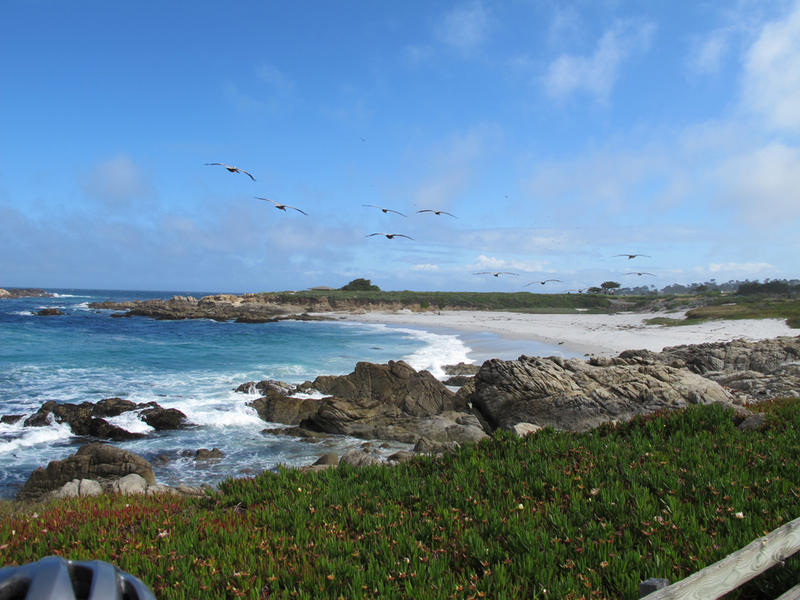 Sea gulls and pelicans swooped and cawed against the backdrop of slapping waves and laughing children. Against our will, it was time to head back for dinner. 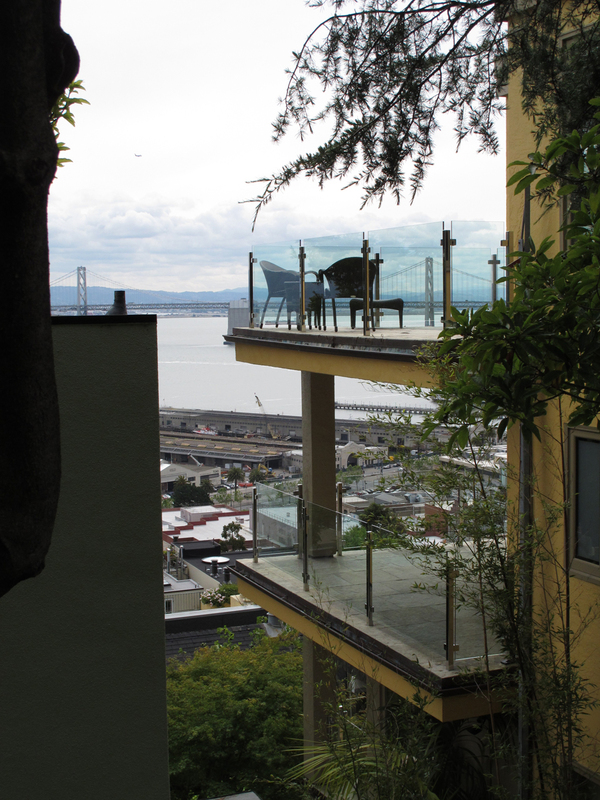 But we couldn't skip the rooftop at the Canary Hotel which we had heard had marvelous views. We made our way up there only to find that we had to navigate through a wedding to get to the 2nd tier. And who should we find but Anne, Tom, Jeff and Pam in the hot tub, and Laurie enjoying a book on a lounge chair. Stewart and Jeff exchanged stories of their fathers having been prisoners of war in Japan during WWII ... what a small world. They weren't at the same place but very near and roughly the same time. Our last dinner together was at the Canary where Anne finally wore the red dress she had purchased for the trip. Stewart had the "Market Menu" of locally raised steak. We gathered for a group picture in the lobby and one of the hotel employees took lots of shots, but we found to our chagrine that our zeal in re-charging our batteries had left our camera without one. Oh well, maybe we'll get a copy from one of the others there. Back in the room we fired up the Tour Tracker to catch Levi and Chris Horner hammering up Mount Baldy leaving the others in their wake. 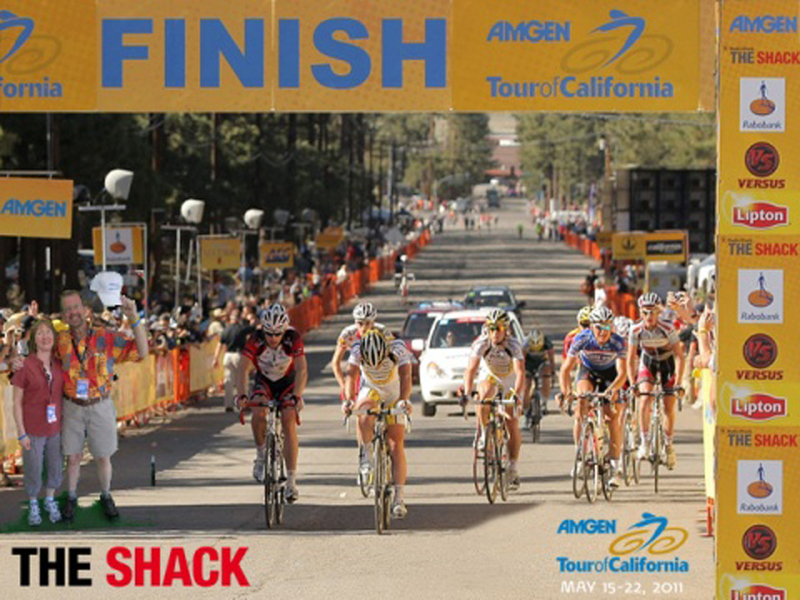 They finished together, with Levi taking the stage and Chris securing his overall jersey. Sweet! 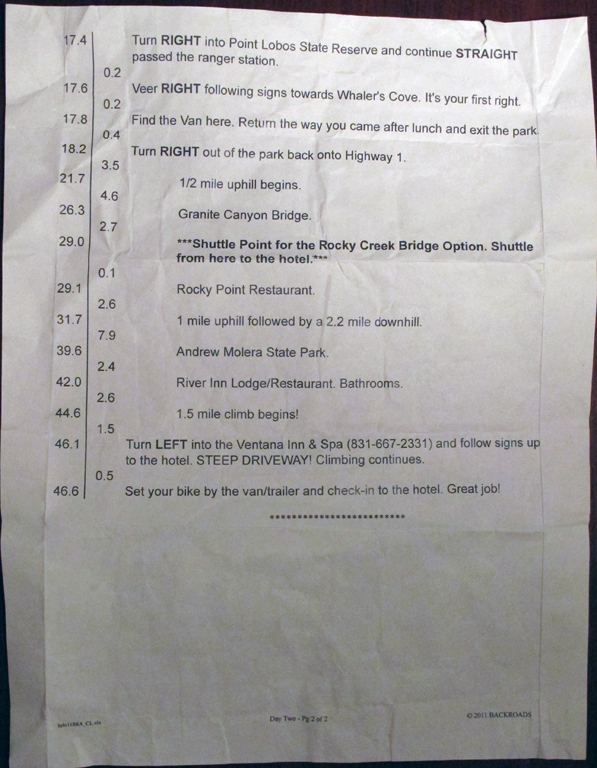 After breakfast, we shuttled up to a nice little park where we got our route rap for the day. Anne's phone rang before it started, and it was Ellen! She was 10 miles from the end of a nice bike ride and was very excited that she had rejuvenated her old Zebrakenko that she bought at the Rainbow Jersey in Milwaukee when rooming with Anne in the mid-70s. She was riding it that very moment so they had a great time sharing a magic biking day. 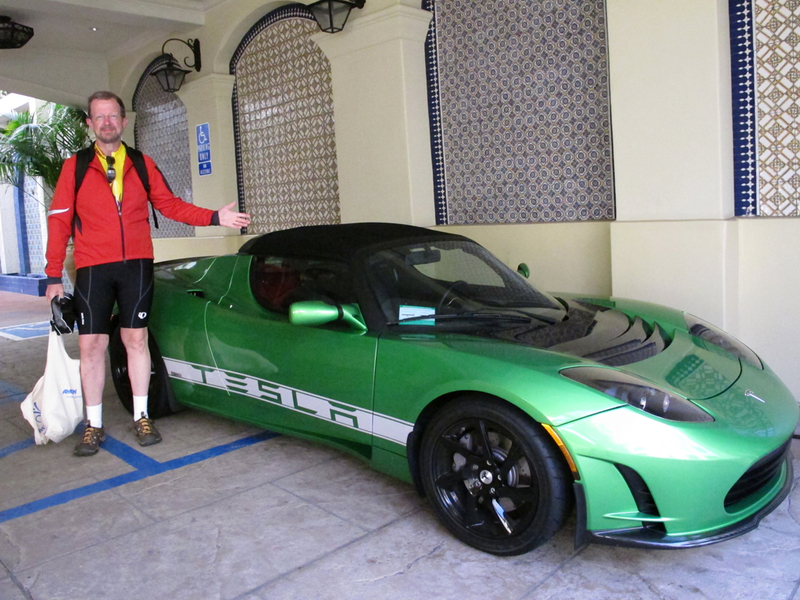 Our last day included a nice 26 mile trip around Santa Barbara, with a long uphill into the mansions and beautiful views of the ocean. The temperatures were perfect, high sixties. We tooled along with the group for the most part although Rich and Teri (both together and separately) sometimes shot off on accidental jaunts of their own. The scenery was stunning, and we rounded off the trip near the gorgeous golf courses of Hope Ranch, emerald lawns punctuated by serene blue ponds shrouded in thick overhanging trees. We grabbed a quick lunch at the hotel (well, we had to eat quickly despite allowing an hour and a half since it took a long time to arrive). We couldn't pass up the homemade donuts though so they packaged them for us to go, along with chocolate and apricot sauces in little plastic tubs. Then we said our goodbyes, got the shuttle to the airport and hopped on the little plane to LAX. The flight was packed again and we used our technique of trying to be last one board by picking up some coffee and bottled water and leaning up against the wall with our bag of jackets and donuts, finishing the coffee while others waited in line. Eventually they started loading and we picked up the bag only to find it sloshing! Apparently Anne hadn't closed the water bottle securely and it totally dumped its contents into the bag. The donuts were a lost cause, so we pulled everything else out of the bag and Anne threw the rest in the dumpster. She was sad to see the bag go since it was a red reusable grocery bag from the Cancer booth and Anne always likes to get the schwag. Once we boarded, things seemed to go smoothly until we got into Texas. There were pretty intense storms in the Dallas area so we landed in El Paso. It only took an hour or so before we were on our way though, and we got the chance to do one last bit of sight seeing... the red sand pockmarked by cactus and mountains surrounding El Paso. These open to a new Tab and start playing automatically. They are also mighty large. They will require the Apple Quicktime plug-in. It should prompt for that if needed. Dan giving us an intro. Rebecca gives us a briefing on what to expect at the ITT. Kids ITT prior to the pros going on ! 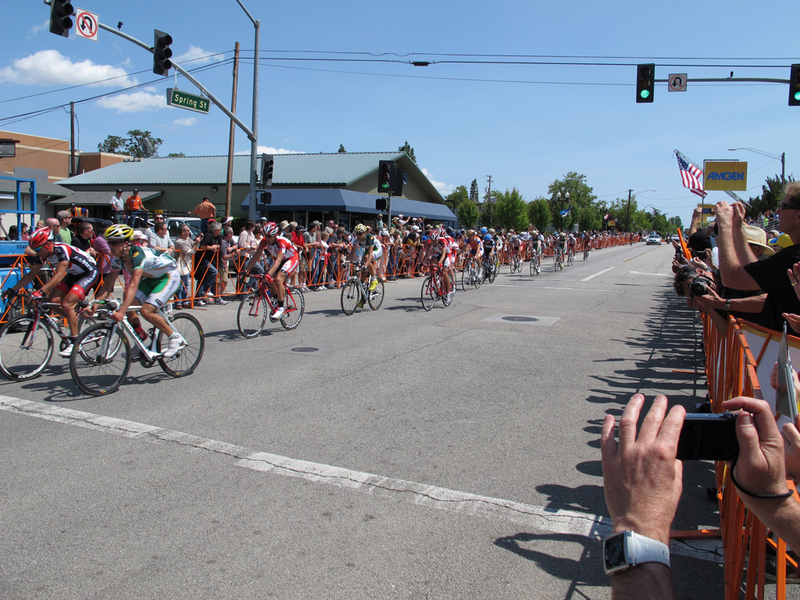 Field Spring Concluding Stage 5 in Paso Robles. 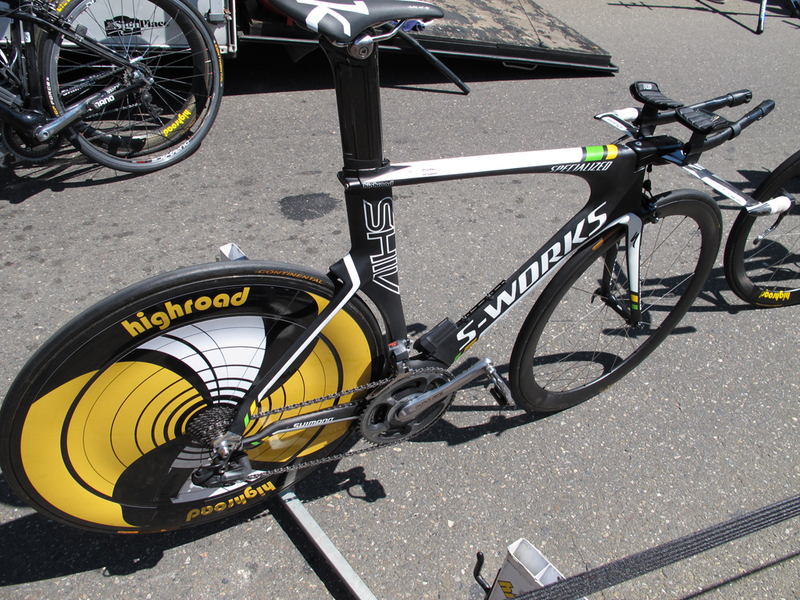 144 riders participated in the ITT, leaving at 1 minute intervals. 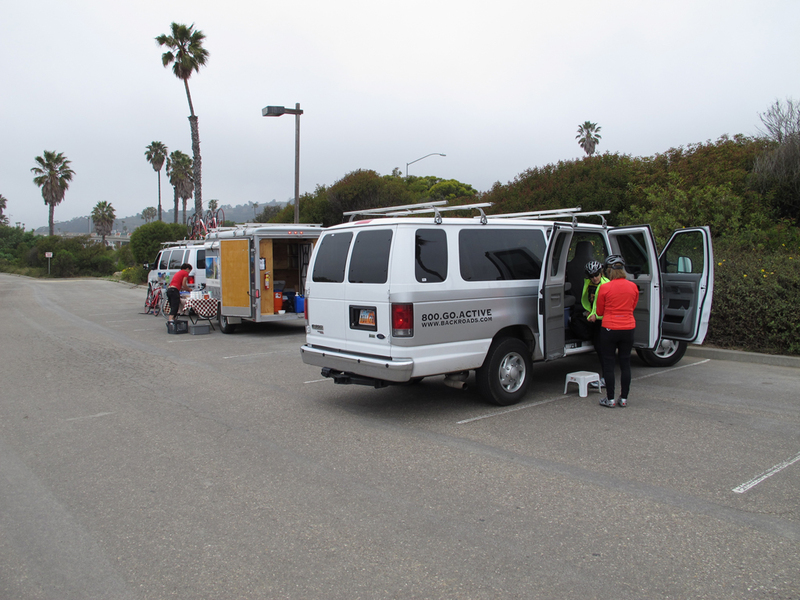 Ben King of RadioShack Launches at the Individual Time Trial in Solvang, CA. Levi Leipheimer of Radio Shack at the Solvang Individual Time Trial. 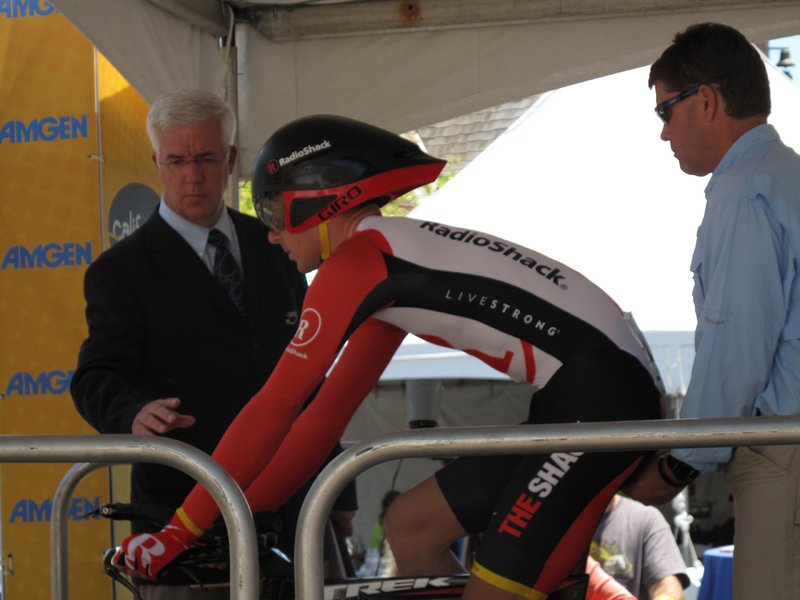 Chris Horner of Radio Shack at the Solvang Individual Time Trial. 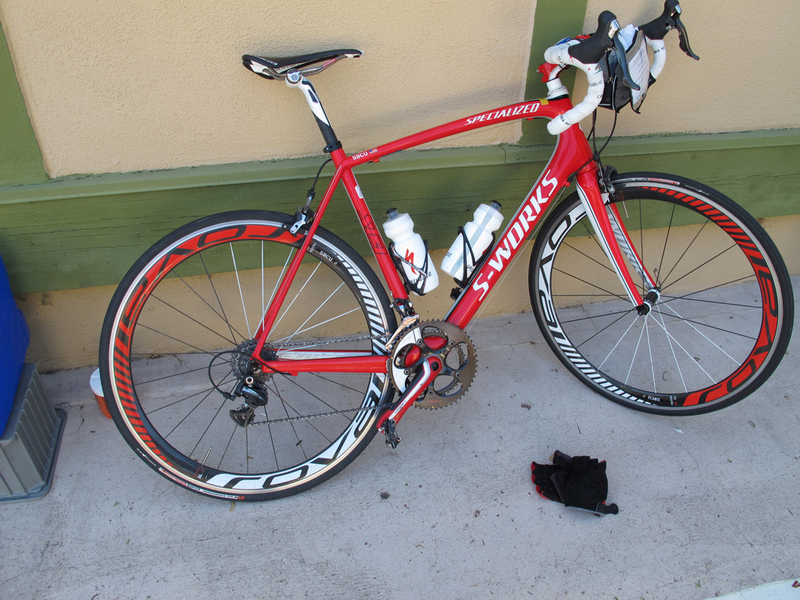 Stewart rides for 2 days on a Specialized Roubaix demo bicycle. 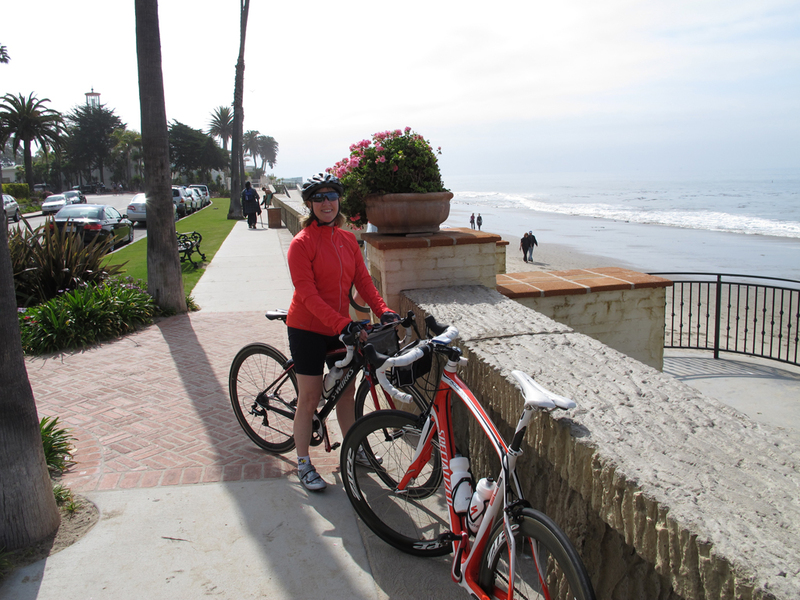 Surrey Riders at the Santa Barbara Pier. 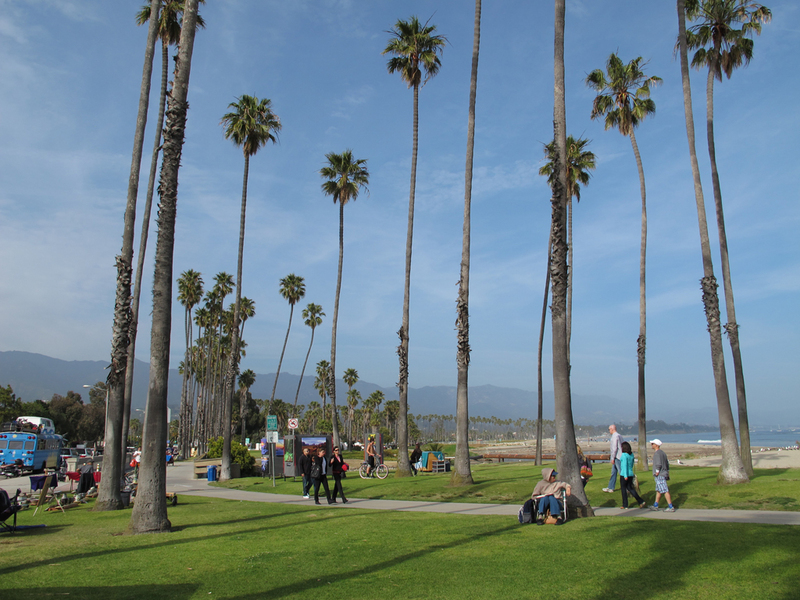 Santa Barbara Beachfront, see John and Laurie bike by.